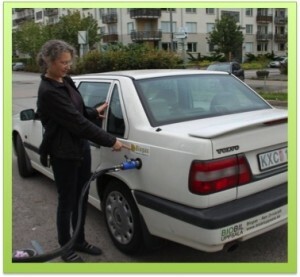 In Tellus Think Tank’s last article we met Åsa Arrhenius, PhD in Ecotoxicologi at the University of Gothenburg. We learnt about the hundreds of thousands of chemicals in our lives and we are getting exposed to them through what we buy and bring home; food, clothing, furniture, body products and household chemicals. Chemical substances like PVC, Phthalates, Bisphenol A are either carcinogenic, affect human fertility or cause allergies. Read the Tellus Think Tank article about the toxins in our lives. Public awareness is still low, or latent, and most people still lack awareness of the effects of the chemicals overflowing their lives and homes. 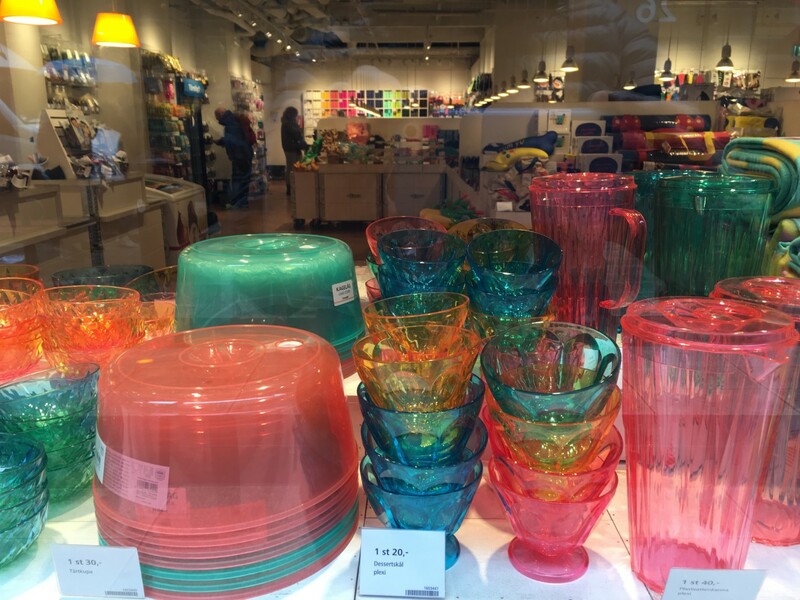 A new movement is slowly dawning and some of the pioneers can be found in the Facebook group “Plastic diet” (the actual Swedish name on Facebook is “Plastbanta”) where members share ideas on how to reduce the amount of plastic in their homes. 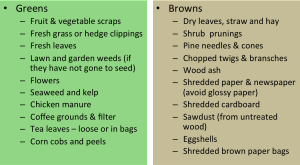 For English readers the equivalent groups are the “No Waste groups”. Madeleine Norman is one of the active plastic dieters in the group and has soon plastic dieted her entire home. For Madeleine it all started with a lecture in Environmental Sciences at Linköping University, five years ago. Madeleine is one of the pioneers in “Plastic Dieting”. her everyday life. She was struck by an overwhelming worry of how the chemicals could be effecting her yet unborn child. The lecture Madeleine attended had covered the subject of Bisphenol A’s effects on male fetuses. The chemical increases risk for male children to be born with damaged genital organs and can seriously affect men’s sperm production. The realisation that this chemical and other harmful chemicals like PVC and Polyethylene Phthalates are to be found everywhere in our everyday lives became too much to bear and Madeleine began researching how she could adjust her life to contain less toxins. Madeleine’s quest started by finding out where the harmful chemicals, such as Polyethylene Phthalates, could be found. 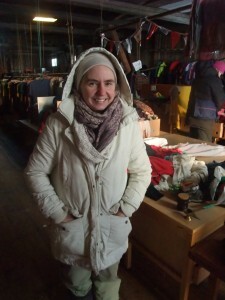 One unexpected place was in textile rainwear. The plastic in rain clothes has been hardened and normally doesn’t release plastic particles. However, when heated in a washing machine, the toxins are released into the water. Modern water and waste treatment plants are not able to distinguish micro plastic particals from the water. In the first step the micro plastics are rinsed out into our lakes and seas. In the following steps of the ecosystem they are eaten by plankton, then fish, birds and humans. Madeleine says her University studies in Environmental Sciences taught the students about the increased amount of cancer found in fish. Madeleine began with her plastic diet and says that she originally wanted to throw out all the plastic in her life. She and her man where just in the beginning of creating a home so they replaced all the plastic things that they could afford. Madeleine shares insights from a survey performed by the Swedish Emergency Services which showed that IKEA furniture, during a fire, emits both formaldehyde and water toxins. She continues to tell me that she thinks IKEA does mostly good things in sustainability and highlights a good example where IKEA is offering a whole collection made of cork. -It is good when large companies are motivated to increase sustainability, she says, because it affects so many! 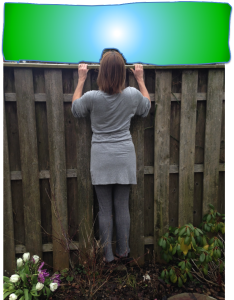 Another hurdle that Madeleine found was difficult to overcome were toxins found in various body care products. Nowadays she only uses “No’poo” products. Grocery shopping often means bringing home an array of toxic plastic. Supermarkets often pack their foods in plastics containing Bisphenol A and almost all vegetables are placed in thin plastic bags to ease weighing and transportation. Paper bags are seldom available as an alternative. 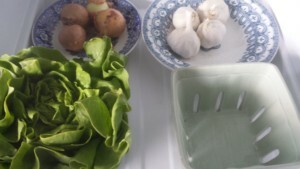 Madeleine washes her fruits and vegetables as soon as she arrives home and keeps them in glass or metal containers. The downside with this practise is that the food doesn’t last as long as in plastic but that is a trade-off that she is willing to make. Madeleine prolongs the life of her cucumbers by storing them in a stainless steel container with a lid. In the summer she grows her own cucumber on the balcony, to avoid the plastic packed cucumber from the supermarkets. 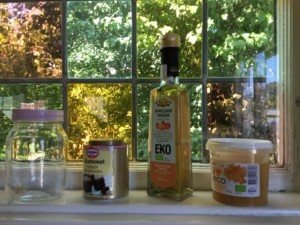 Madeleine shares some advice to those who are interested in doing their own plastic diet. She recommends to start ones plastic diet the kitchen. She especially recommends changing out plastic wear that is heated – as this is when plastics emit particles and toxins. The first thing she recommends to remove are the pans with Teflon, plastic spatulas and the like. -Buy Cast iron boilers or boilers in stainless steel or carbon steel. 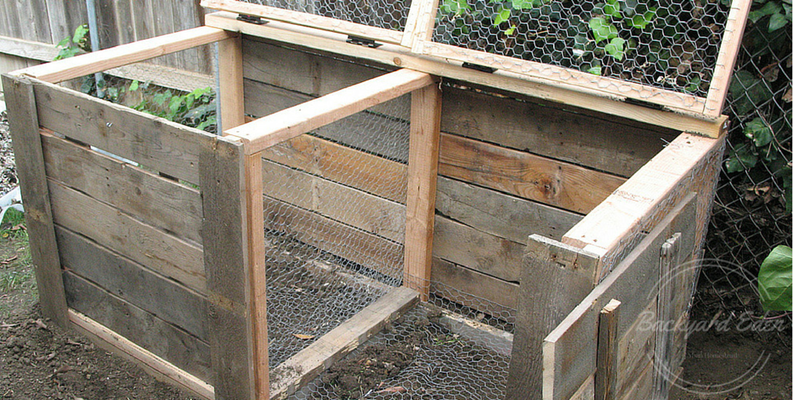 Ikea has sustainable alternatives. Replace your plastic water kettle with one made in stainless steel, says Madeleine. She shares advice on cooking in the microwave oven. Many people heat their food in plastic containers. 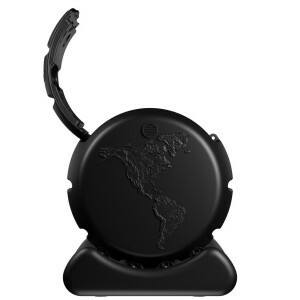 It is better to put the food on a china plate and to stop using the plastic splash guard all together. In Madeleine’s home there are no plastic toys to be found. They use a lot of porcelain and glass. Food is stored in steel, glass and porcelain. We learn that her linoleum floors don’t contain plastic when looking this up in the book “Rumsrent”. According to this book linoleum contains linseed oil, rosin, wood flour or cork flour. Much of Madeleines furniture is made of solid wood and has been purchased at flea markets. She guesses that the wood might have been lacquered with epoxy varnish, often containing Bisphenol. If a piece of furniture has been varnished Madeleine won’t remove it as the dry coat of varnish doesn’t release particles. However if she needs to treat a piece of furniture, she would rather use linseed oil than paint or varnish. Madeleine says that it has been difficult for her to replace the foam mattress of her bed and they have still not been able to afford to do so. It is certainly difficult to live without plastic altogether and Madeleine takes up the world of health care. Plastic tubes containing Bisphenol A are used for feeding premature infants, as the chemical soften the plastic probe. So far there are no alternatives to the Bisphenol softened plastic probes but Madeleine finds their use preferable as they make it possible to save the lives of infant children. Madeleine reveals that she underwent surgery at age seven and was given a plastic implant. She reasons that if the plastic implant gives her cancer at the age of 50, it has nonetheless given her 40 years extra to live. Sometimes it is very easy to choose the plastic option. 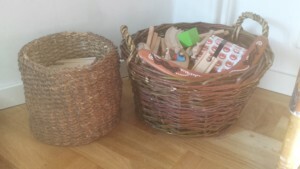 Socially Madeleine moves in circles where knowledge of the effect of plastic is high and several persons have done the plastic diet treatment on their homes. She guesses that the general public is less knowledgeable about the over-exposure to toxic substances from plastics and other stuff in our lives. 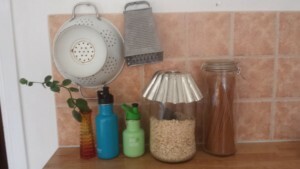 We discuss the “Plastic Diet”- and Zero Waste groups – on Facebook and Madeleine says that she is impressed and fascinated by how innovative people are. Some avoid paper handkerchiefs if in plastic packaging. Others buy their food in bulk to avoid plastic wrapped food (this is hardly possible in Sweden). There are also individuals that crochet their own cloths in linen to avoid micro fiber cloths. 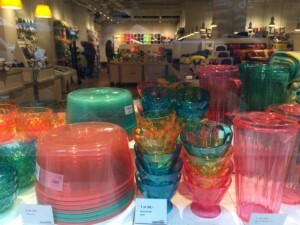 How do you think Sweden should adapt its legislation on plastic? 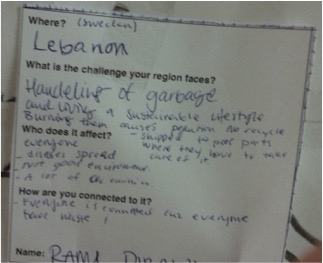 -Sweden has a well developed system for waste collection, says Madeleine. She still has a couple of improvements to suggest, such as that the public waste collection stations also should be open to more plastics than just plastic packaging. She is sure that this would give some quick improvements. A plastic ban of this kind would bring significant savings to municipalities. It would save costs from having to gather plastic garbage from streets. The large amount of plastics having to be handled in waste plants would be reduced. A plastic ban would also bring better public health. What advice, in addition to the above, you want to give to people just starting off with their plastic diet? -Don’t panic. I tried that when starting out with my plastic diet and it made me feel pretty bad. My advice is to use the plastic stuff that you have at home until it’s not fit for its purpose anymore. Make the better, plastic free choice next time. Change takes time! Smiles Madeleine Norman. In Tellus Think Tank’s next article we meet Fäviken that has been awarded two Guide Michelin stars. 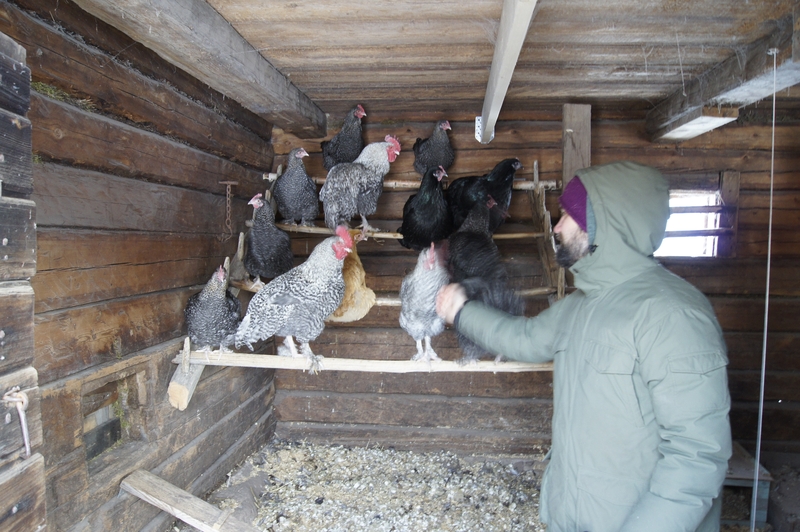 The Fäviken food policy strives to serve locally produced food. 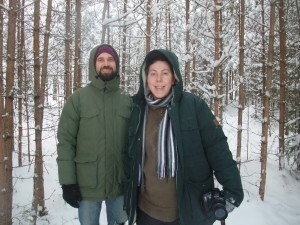 Tellus Think Tank will sort out if that works when being located in the Northern wilderness of Sweden get notified when the article is available! Alternativ livingAlternative livesCan Earth be saved?Challenges of EarthChallenges of humanityCommunityFor a Sustainable FutureImprovements of communityImprovements of lifeInspirationalInspiring sustainabilityPioneersPlastic dietSustainabilitySustainable citiesSustainable citySustainable communitiesSustainable communitySustainable livesSustainable UniversitiesSustainable UniversityTellus Think TankTellusThinkTank.comwe can save Earth! Ecotoxicology is a research area in ascent. Since the beginning humans have survived by finding and making things in nature. Today we use thousands of chemicals that affords us new functionality. Unfortunately the chemicals also bring toxins into our every day lives. Tellus Think Tank contacts Åsa Arrhenius, doctor of Ecotoxicology, to learn more. 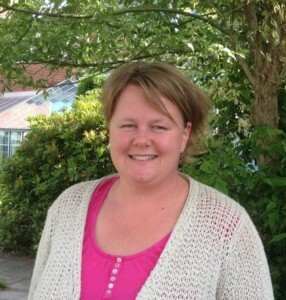 Åsa Arrhenius, Coordinator of FRAM and PhD in Ecotoxicology at the University of Gothenburg, Sweden. 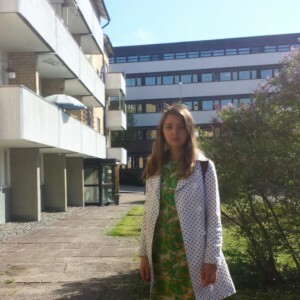 Ecotoxicology at Gothenburg University. She is also the coordinator of the newly established interdisciplinary “Center for future chemical risk analysis and management at the University of Gothenburg” ( FRAM). Åsa Arrhenius says that humans are most sensitive to toxic chemicals when still in the womb or in adolescence, during periods of life when the body is growing and developing. As adults, the effect of chemicals is not quite as considerable. However, adults can transfer chemicals to children, for example during pregnancy. Åsa Arrhenius tells us that we now use hundreds of thousands of chemicals compared to just a hundred years ago. Some of these new chemicals are found in our homes. One example is Phthalates that are unhealthy and toxic. Phthalates can be found in, among other things, plastic toys. 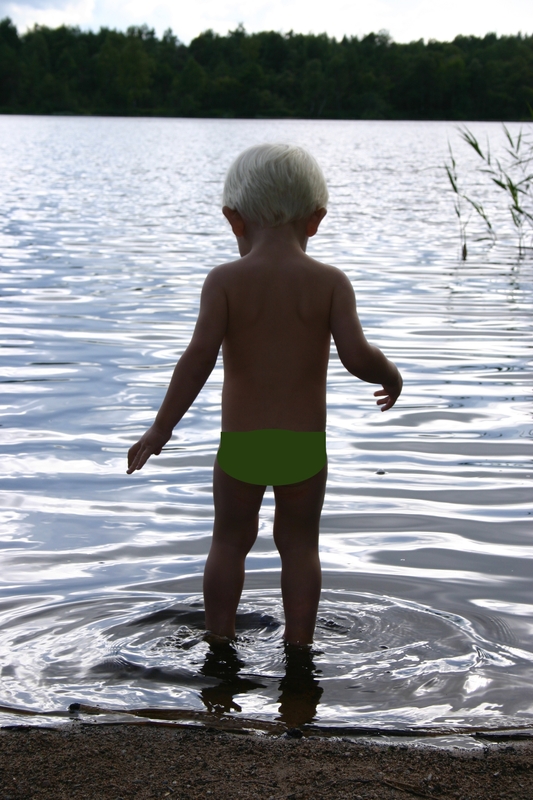 According to the Swedish Nature Conservation Society (Naturskyddsföreningen), being overexposed to Phthalates can lead to severe deformities of children when still in the womb. Other risks are fetal death, decreased birth weight, undeveloped testicles, penises and livers leading to permanently damaged performance and tumours. Fortunately Phthalates of some kinds are banned in the EU since 2015, but they are very likely still to be found in our homes. The Phthalates are used to soften plastics and rubber products, such as baby changing table covers, rubber ducks and plastic toys. Åsa Arrhenius says that even textiles may contain toxic substances. Toxic chemicals may have been added during manufacturing or added to protect the fabric. The functionality sought by use of these chemicals is certain types of colour pigments, flame-retardants, anti-mildew, water and dirt resistant effects. According to the Swedish Chemicals Agency (Kemikalieinspektionen), textiles can contain toxins. They write about the carcinogenic Formaldehyde, Chromium compounds and Phthalates that also can cause allergies. Åsa Arrhenius says that clothing with certain features such as antibacterial branded clothing and sweat repellent branded clothing and footwear can contain unhealthy toxic substances. She recommends avoiding these types of goods. We talk briefly about the admirable plastic ban that was introduced in Rwanda in 2008 (read article) . 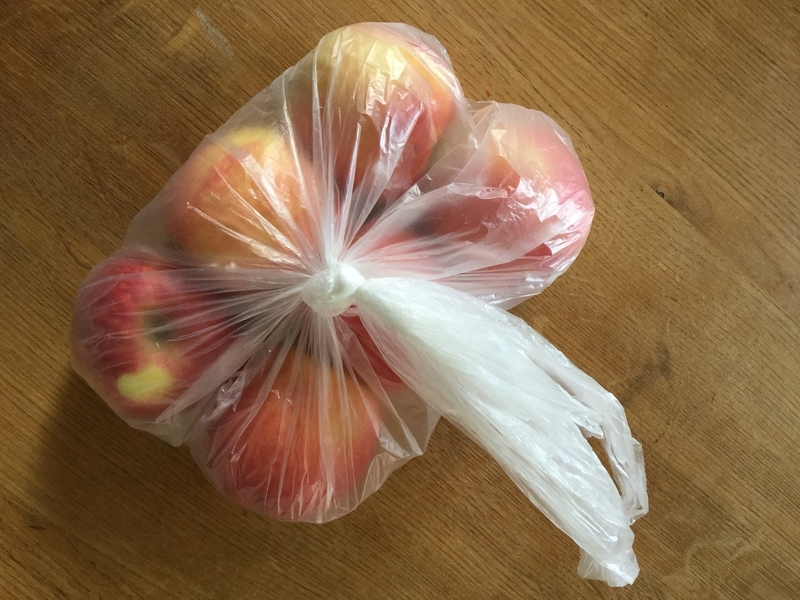 This leads us to the small soft plastic bags, used daily, for example when buying fruit in the supermarket. These small bags often contain the chemical substance Bisphenol A. Bisphenol chemicals are used to soften plastic. reason for the EU banning Bisphenol A in baby bottles. Sweden has its own wider ban of Bisphenol A forbidding the chemical in food packages for children up to three years of age. The Swedish Chemicals Agency has also proposed that Bisphenol A should be banned in the thermal paper that is used in receipts and tickets. The Tellus Think Tank editorial team finds it extraordinary that Bisphenol A is allowed in food packaging at all. We would, as an example, prefer not to find Bisfenol A in the plastic coating on the inside of canned food. EU controls much of the legislation and use of chemicals. Countries such as Sweden, Germany and Holland are driving forces in introducing stronger regulation on the use of chemicals. Sometimes they have to hold back their ambitions (on the pace) as the EU ‘s legislative work takes longer than wished for. It can be perceived that the EU is hindering efforts to strengthen legislation on toxic substances, however Åsa widens the perspective. She reasons that chemicals cross country borders with the movement of people and goods but also with rain and wind. She means that a ban in one country therefore only has a limited effect. EU legislation may be cumbersome but when in place the impact across the EU is immediate. Eu legislation reaches way beyond the borders of Europe as imported goods from all corners of our planet have to follow the same legislation. Regardless Åsa Arrhenius recommends to avoid buy plastic toys or plastic products from countries like China. 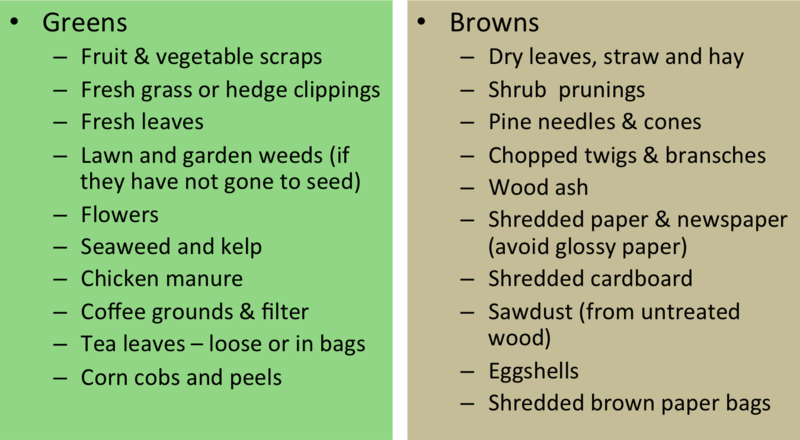 When possible cut down on the use of chemicals and plastic in everything from food, clothing, detergents and medicine. Have a headache? Rather that routinely eat painkillers try and slow down for a while, take it easy and have a glass of water. 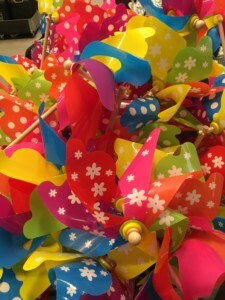 Discard old plastic toys and send them to recycling instead of to the flea market. Replace plastic things in your home with more natural materials such as wood, glass and ceramics. Reduce your direct exposure to harmful chemicals in new textiles by washing before you use them. Unfortunately the chemical residues in waste water might end up in nature. When microwaving: Don’t use plastic containers, it is better to use glass bowls. When cooking: Avoid heating plastic utensils and bowls as the heating process can release toxic substances in them. Be an active consumer. 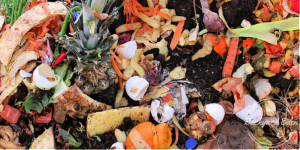 Consumers have an enormous power – remove the plastic packaging in the supermarket and ask if the store might consider packing their food in other ways. Air your home regularly to rid it of deposited chemicals from plastic things, paint and furniture. If possible, use eco-labelled products and food such as the EU eco-label and others. Try to avoid detergents and cosmetics products that may contain plastic in micro formats. Any hope on less toxic substances in our lives? Åsa Arrhenius believes that general awareness on toxic chemicals is increasing. 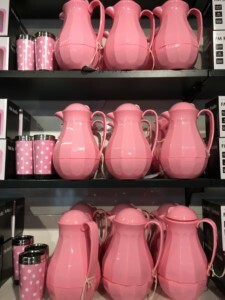 Stores around Sweden say that eco-labelled food and products are on demand. One area that FRAM, the centre that Åsa is coordinating, is looking into how to develop economic and legal instruments to bring about faster change. FRAM wants to help get legislation in place that encourages producers to replace harmful substances with more healthy ones. On the whole, we still have a lot to learn on the effects of the thousands of substances that we are exposed to through different products such as detergents, medicines, plastics and food in our lives. Fortunately, there is progress in both research and legislation in the field of Ecotoxicology. Read more about how a more sustainable future might look, here! 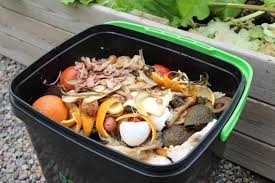 In Tellus Think Tanks next article we meet Madeleine who performed a “Plastic Diet” in her life and home. Get notified when the article is available! Åsa Arrhenius, PhD in Ecotoxicologi at the University of Gothenburg. 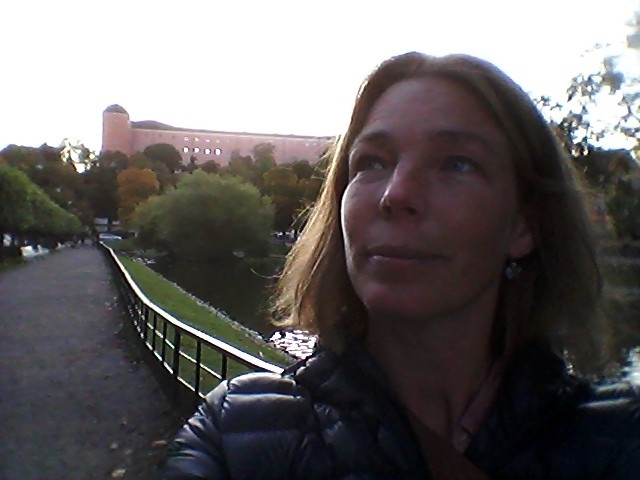 Since 2016 Åsa is also the coordinator of the Center for Future chemical risk analysis and management at the University of Gothenburg”, FRAM. The University of Gothenburgh, Sweden: 37 000 students, 6000 employees, 282 PhD graduates per year, 2000 research students, founded 125 years ago in 1891, 538 professors in 8 faculties: Natural Sciences, Humanities, Art, Social Sciences, Business Administration, Education, IT faculty, Sahlgrenska Academy (medical). FRAM – Center for Future Chemical Risk Analysis and Management at the University of Gothenburg. 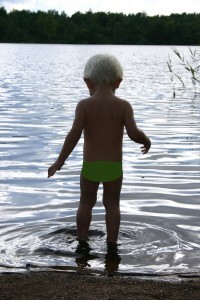 The centre aims, among other things, to find safe limits for chemical contaminants to protect people and the environment and believes that the effect of chemical mixtures are more toxic than single chemicals on their own, something that we should focus on in order to get to a more sustainable use of chemicals. Alternativ livingÅsa ArrheniusCenter for Future Chemical Risk Analysis and ManagementChallenges of humanityEcotoxicologyFRAMGothenburg UniversityImprovements of lifeInspiring sustainabilitySustainable communitySustainable foodSustainable livesSustainable UniversitiesSustainable UniversityTellus Think TankTellusThinkTankTellusThinkTank.comToxic everyday livesToxinsurban planningwe can save Earth! We where lucky to get in contact with Sandra Kanck, President of Sustainable Population Australia (SPA) for an on-line interview that turned out to be very interesting and enlightening. 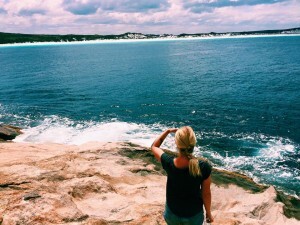 Tellus Think Tank normally strives to share inspiration on sustainable happenings around our globe, to be able to help people and societies chose a more sustainable path. 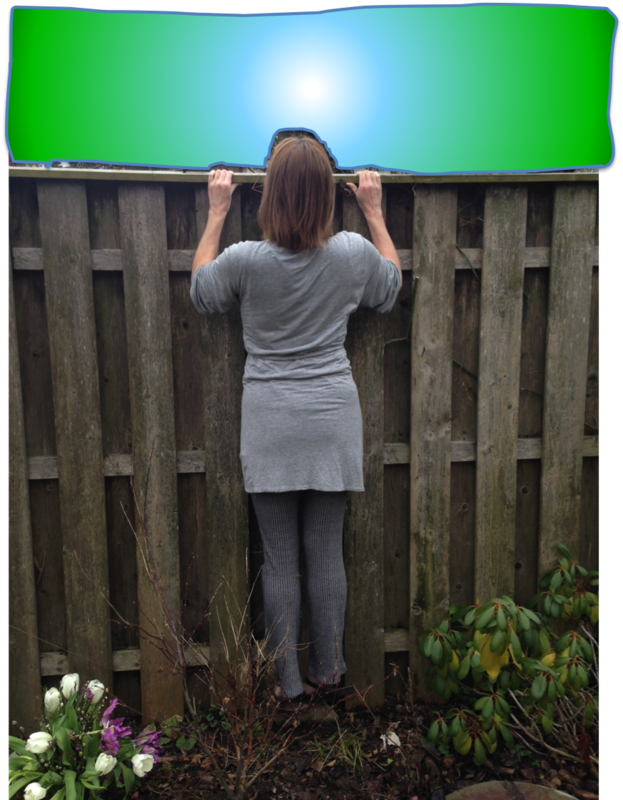 Our interview with Sandra showed challenges, some still without solutions – which can be inspiring to problem solvers. So let’s hope this interview shares some enlightenment and helps enhance problem solving in that force of friendly individuals that we know exists around the world! Read more: The Growing Population of Earth. 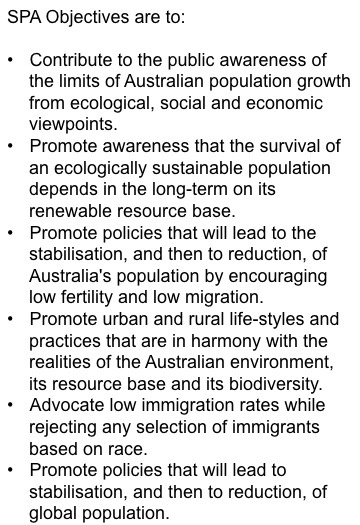 Sandra Kanck, President of Sustainable Population Australia, March 2016. Sandra, where were you brought up and what brought you to where you are today? I grew up in Broken Hill, a rural city in outback Australia, and was the oldest of seven children. I learnt early on that my school friends who all came from smaller families had more money to go round. In my early 20’s I became involved in the anti-nuclear movement, and from that progressed to the peace movement and wider environment movement. From there it was a matter of joining the dots and finding the right group to join. 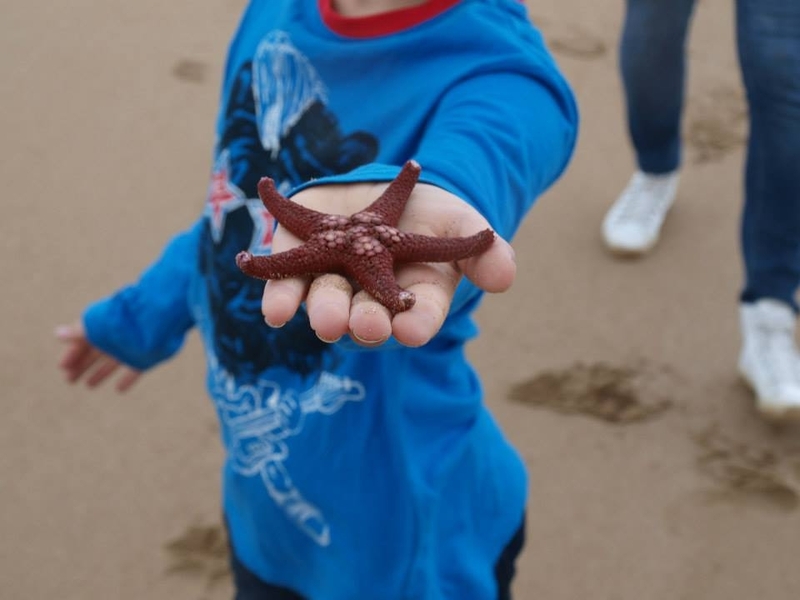 How was your connection to nature in an early age? Do you have any specific memory that sticks out? Broken Hill was a town of 30,000 people surrounded by arid lands, where kangaroos and emus were common outside the city limits. The dry climate meant I occasionally experienced fierce dust storms, and I was brought up to understand the importance of conserving water. 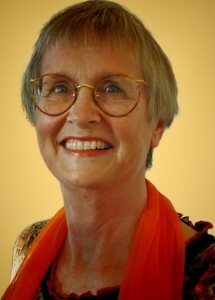 You are the national president of Sustainable Population Australia (SPA). What kind of an organisation is SPA and what does SPA stand for / aim for? SPA visions a relationship between humans and the natural environment which ensures the integrity and sustainability of the Earth’s life support systems, the on-going evolution of natural living systems and the well-being of every person in a sustainable population. 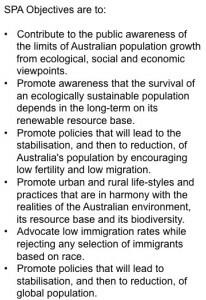 The mission of SPA is to establish Australia as a global model of, and to assist other nations toward, a sustainable ecological life-support system, retention of species diversity and human wellbeing, by influencing public debate and policy with particular emphasis on population size. How did you get engaged in SPA? 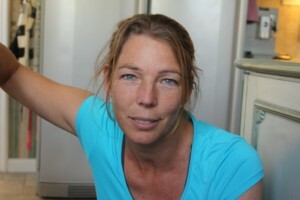 Sandra tellus us: Senator John Coulter employed me. We had worked together in the Conservation Council of South Australia prior to his being elected to parliament. He gave me a membership application form. The country of Australia is equally as big as the USA (population 320 Million) and China (population 1.3 Billion) and Europe (population 740 million). The population of Australia has just reached a population of 24 Million. SPA and others in Australia are wording worries about the 24 million population of the Australia being to big. Why is the, in comparison to demographics of other regions on Earth, small population of Australia something to be concerned about? Australia is still very sparsely populated in comparison? 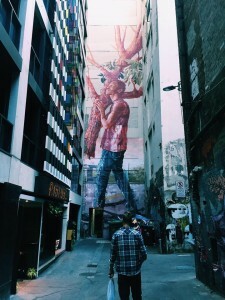 Only six per cent of Australia’s land mass is capable of producing food, and that small amount is being trespassed on by urban sprawl as a consequence of population growth. The climate is overall arid to semi-arid and impending climate change will exacerbate that. The average altitude for the whole country is 330 metres, meaning that there are only a few areas where snow falls with subsequent spring melts. with no potable water sources. Geologically, there has been no major uplifting, land building or glaciation for millennia, and the consequence is highly infertile soils with a very low soil profile of no more than 7cm in arid areas. 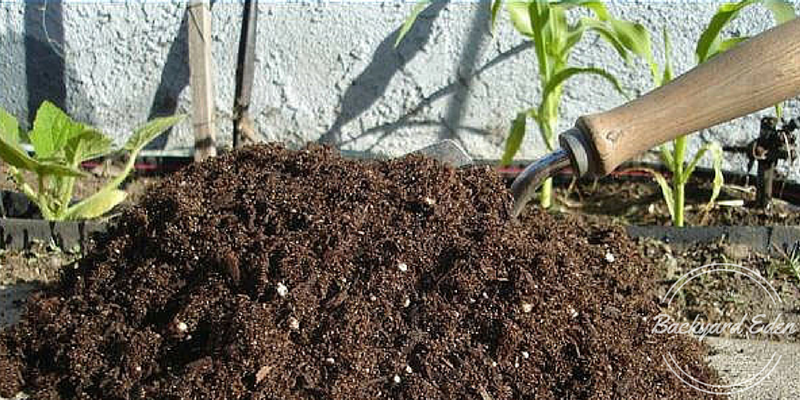 The poor soil has been extensively over-grazed. Introduced species such as cats, rabbits, foxes and cane-toads wreak havoc on the natural wildlife. 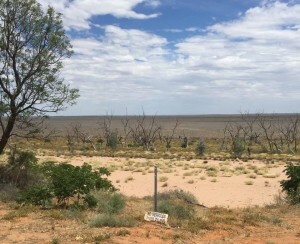 So Australia is a very arid country, has it not always been dry? to understand that drought is the norm in most of the country. Droughts used to occur once in twenty years, but they now occur in six out of ten years. Major flooding used to occur once every 5-7 years, but now occur every 14 years. Australia’s major river is actually a cluster of 23 rivers in what is known as the Murray-Darling Basin. By European standards it is little more than a stream. Although the basin and its tributaries spread over one-seventh of the continent, the annual flow is equivalent to less than a day’s flow of the Amazon. Of the rain falling on the basin 94% evaporates. The basin still produces 40% of Australia’s agricultural produce. 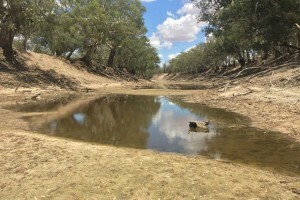 But while Australians are so very dependent on that river system, a 2014 study from Australia’s major science organisation, the CSIRO, predicted a worsening of this situation with a reduction of rainfall in this region of up to 70% by 2070 because of climate change. Meanwhile, at the present time in Australia, a 400 km stretch of the Murray River has been subject to an algal bloom due to slow-moving water and high temperatures, making that water toxic for human and animal consumption. The algal bloom normally resolves with cooler weather but each year the algal bloom outbreaks are more frequent, more extensive and last longer. At the same time the southern-most state of Tasmania, which has long prided itself on being energy self-sufficient by using hydro-electricity, has found itself in a crisis situation where the dams that feed the water to produce electricity are at less than 17% of their capacity. What is the root cause of the sustainability problems in Australia – is it only the growing population? Sandra gives us some facts: Basically the problem is a fragile environment, which can sustain no more than 23 million people according to The Australian Academy of Science. Some estimates set the sustainable level at a much lower figure of 7 million. Whichever of the two figures is correct, at a population of 24 million we have gone beyond Australia’s environmental limits. What is the main reason for growth of the population? Over more than a century, successive Australian governments have actively campaigned to increase Australia’s population, and particularly to increase immigration. Until very recently, 60% of the population growth has come from immigration and 40% from natural increase. In the last two years that has altered to a 55%/45% ratio, due in part to a pro-natalist policy introduced a decade ago called the ‘Baby Bonus’. 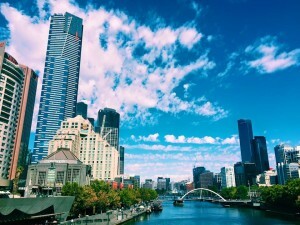 What would happen if the population of Australia grows, according to some forecasts, to 33 million by 2050? What problems would be directly visible due to the population growth? And indirectly? 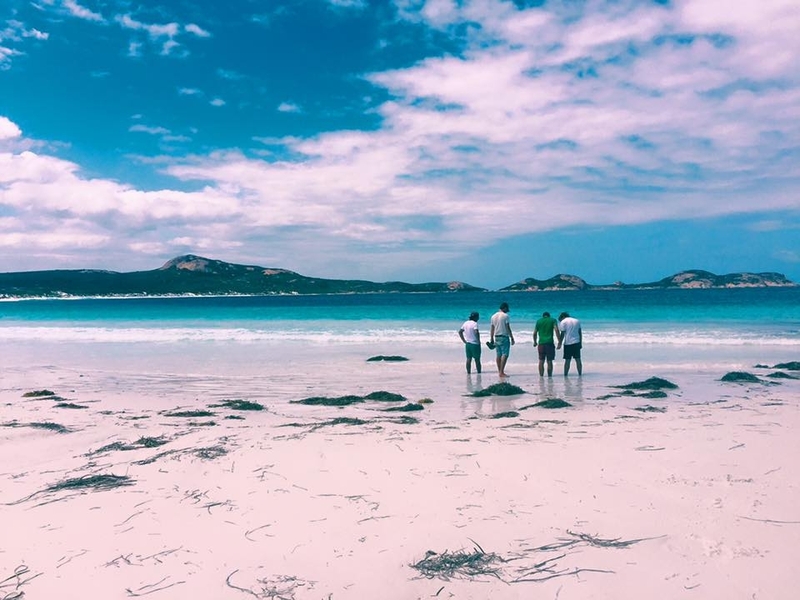 If global warming continues saline waters might make its way into estuaries and fresh water rivers of Australia. 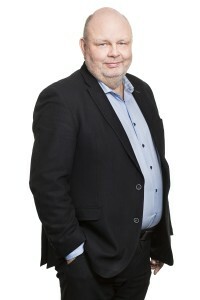 Photo: Hanna Sjöberg. Increased demands for water. Lowering of water tables. Reduced water flow in major rivers including an increase in algal blooms. Increased demands for food production. Declining fish stocks. An increase in the infrastructure deficit. Shortage of affordable housing. Enormous waste management problems. Ingress of saline waters into estuaries and rivers. Increased urban traffic congestion with associated reduction in air quality and an increased demand for fuel. Loss of open space and biodiversity habitat. 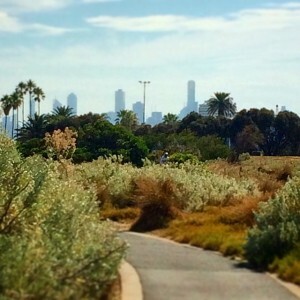 Urban pressures on agricultural land. is good, and so they do not see problems arising, and therefore have no solutions. What would SPA prefer to be the current (year 2016) action? Acknowledgement from government that there will be big problems in the future has to be first step. Until that happens a conversation about what we need to do is all but impossible. According to some people – SPA is a racist organisation – what would be your response to this? I would tell them they are speaking nonsense. SPA has consistently called for a significant increase in our humanitarian (refugee) intake, cutting our immigration intake to allow this to happen. The source of refugees is generally from politically unstable areas in the Middle East and Africa. If we were racist we would set out to exclude them rather than encourage an increase in their numbers. If the global warming continues it has been predicted that large movement of people over the globe would become a reality, as many will be in search of better living conditions with fresh water etc. If the climate warming continues would people be moving to or from Australia do you think? The Pacific Nations of Micronesia according to truepacificdotcom. 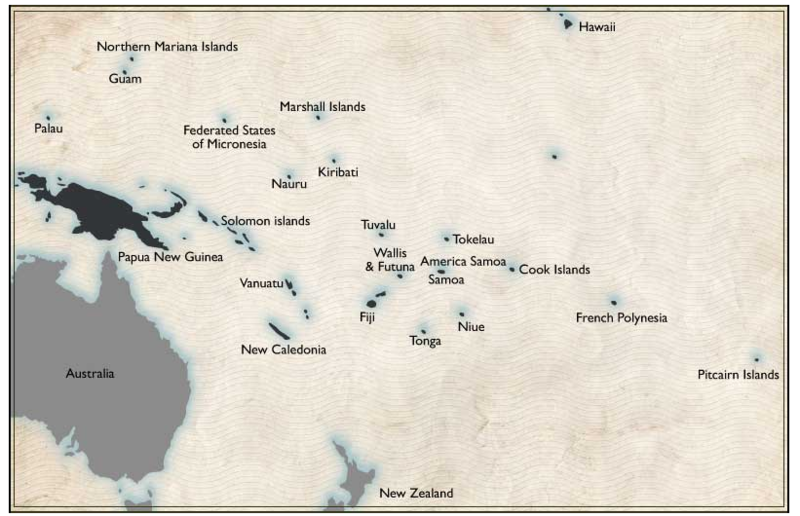 Hold about 40 million inhabitants incl Australia and New Zealand and Papua New Guinea. move to Australia. The Australian Government announced at the COP-21 climate change talks that is has allocated $1bn to Pacific nations for adaptive purposes. I believe they think by doing this it will stop them from emigrating. One other choice, in the region, would be New Zealand, as I do not expect they would want to move to another developing nation such as Papua-New Guinea. Examples of Pacific Nations in trouble because of Global Warming are the Pacific Nation of Tuvalu, with a shrinking population. Inhabitants are emigrating to avoid effects such rising sea-levels, cyclones and high waves. The highest ground on the islands is 4 meters (12 feet) above sea level. The Global increase in population and the increase in migration between regions on earth – due to Global Warming making living regions useless to live in due to the climate change? Read more about vertical greenhouses…a technology for a sustainable future. I think that says it all, the question is how to make governments recognise this and act accordingly. Greenhouse Skyscrapers Cars and traffic of the Future About alternative ways of living. planning and contraception in its foreign aid budget. We believe there is nothing more crucial than directly intervening to provide this particular form of assistance to the millions of women in developing nations who seek it. While we agree with aid organisations giving priority to the education of women and girls, we keep working to get these groups to understand that this method will take a generation to bring about the necessary changes, whereas contraception and family planning almost immediately empower women. Environmental refugees are not recognised in the Refugee Convention, and the UN should be looking at this. Without that recognition, no signatory countries would have any obligation to take in environmental refugees. Do you see any light in the tunnel? What hope do you see for the world? 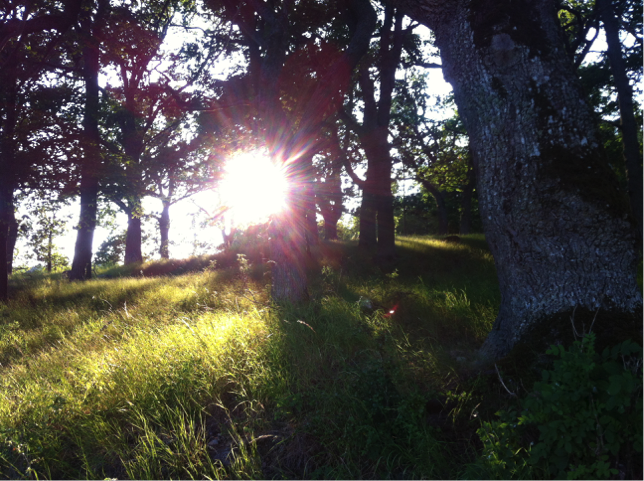 What can globally be done to increase the possibility of living in better harmony with nature? Malthusian future ahead of us given that so many indicators of collapse are coming together at the same time such as population increase, climate change, peak oil (and other resources) and economic instability and with no forward planning by governments. Nature will assert itself, we will be given little say, and it will not be kind. the challenges of Australia and how they are interconnected with the challenges of the Pacific Nations and the rest of the world. Tellus Think Tank, being for a sustainable future, is hoping solutions will be found that will help handle the growing population on Earth. 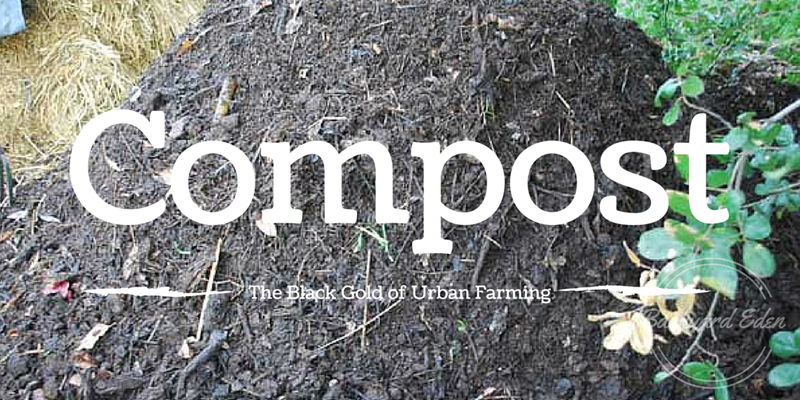 Do you have any ideas or sustainable happenings that you would like to share, send us a message! Can Earth be saved?Challenges of EarthChallenges of humanityCommunityFuture CitiesFuture CityGlobal WarmingImprovements of communityImprovements of lifeLarge populationPopulation growthSandra KanckSPASustainabilitySustainable citiesSustainable citySustainable communitiesSustainable communitySustainable livesSustainable populationSustainable Population AustraliaTellus Think TankTellusThinkTankTellusThinkTank.comurban planningwe can save Earth! Stockholm city has a population of 900 000, in the 1,8 million Stockholm county. 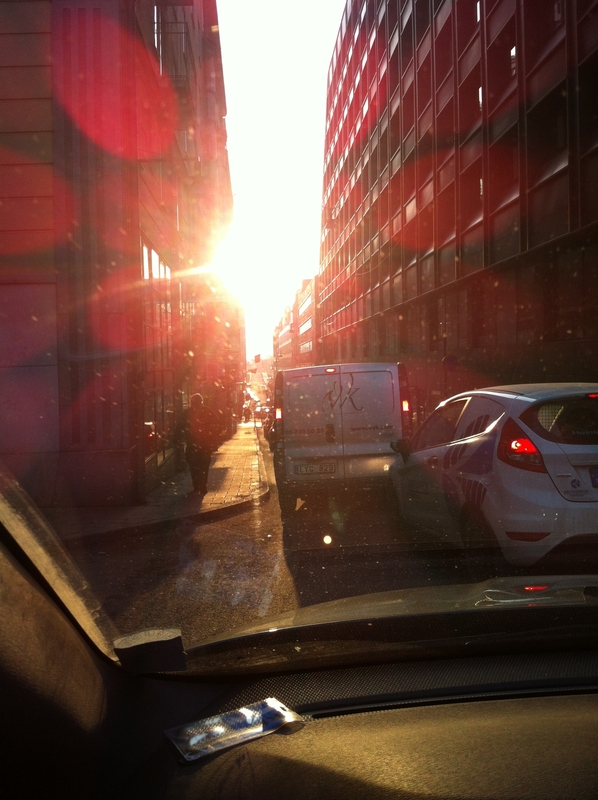 The city employs over 40 000 people to provide the service needed by Stockholmers and companies and owns 800 cars! growing by 15% in the next eight years. By 2024 the city will have another 140 000 citizens, also in need of transport, putting further strain the city traffic situation. Stockholm politicians are aware and cooperating to make a change. The current City Hall majority, a coalition between the Social Democrats, the Green Party, the Left Party and the Feminist Initiative have ambitious plans for a more sustainable city – see last week’s article in Tellus Think Tank. 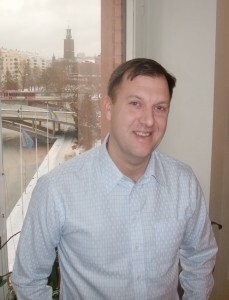 Johan Seuffert is Fleet Manager for Stockholm City and responsible for the vehicle fleet strategy of the city. Johan says that Stockholm City is positive to growth but that many new residential homes need to be added to an already dense city. 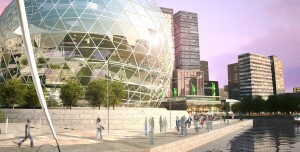 He says that it will be an important task to adjust the cityscape to the growing population. -Car traffic is becoming a question of democracy, he explains, as a car needs at least 6 square meters compared to public transport busses with 40 passengers that only need 40 square meters. Busses are very seldom parked and don’t cram city streets. Johan Seuffert reasons in similar lines as Stockholm City Traffic commissioner Daniel Helldén, when saying that it could be considered unfair that cars are covering the cityscape at the cost of public transport, cyclists and pedestrians. Read more. Cars take a considerable amount of the cityscape, space that could be used to more sustainable traffic such as bicycle lanes, bicycle parking, sidewalks, bus lanes or even more residential homes. The cost of parking spaces when building new homes are making both streets and new residential quarters more expensive. The environmental reasons as equally important, fossil fuelled cars emit greenhouse gases and poisonous particles from fumes and tyres. They are the reason behind much of the sound pollution of the city. 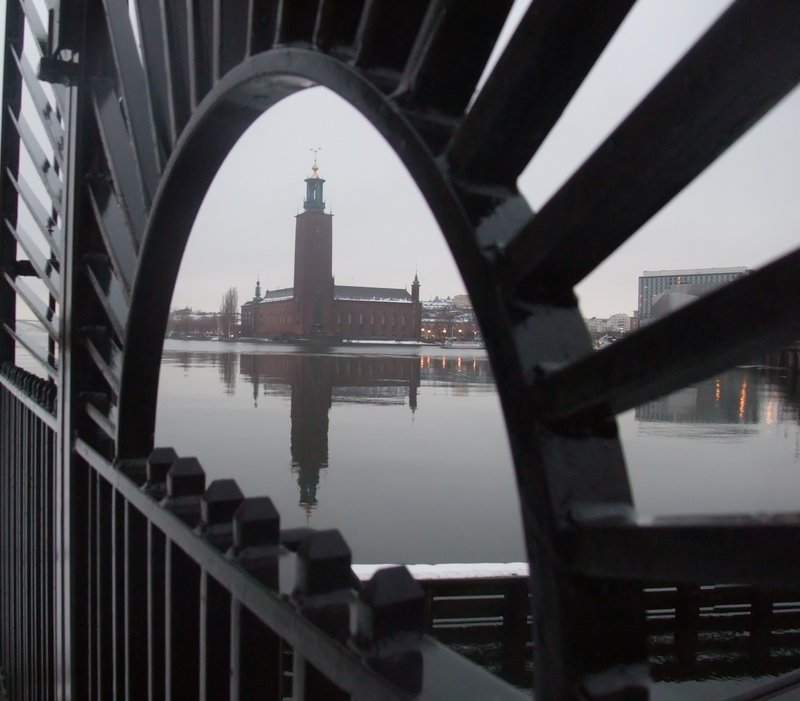 Stockholm wants to increase the sustainability of the city. Johan Seuffert, what plans do you have for the 800 cars in the city vehicle fleet? Stockholms city has several ambitious targets! There are some exceptions that have had to be made, Johan tells me, and mentions some emergency vehicles as the lake ice-plough used to clear snow for skaters. It has an emergency exit in the roof! Johan Seuffert tells me that Stockholm, in all other cases try to adjust the fleet to the national environmental definition which the city, undeniably, has succeeded well with! Tellus Think Tank has in earlier articles written about research that led to the sorting of diesel emissions under carcinogenic substances. Read more in the article about Urban Foresight. The Swedish national environmental definition still includes diesel fuelled cars as it has not been adjusted for a couple of years. However, Stockholm city only keeps a small amount of diesel fuelled vehicles in their fleet of 800. -There is a good supply of electrical vehicles up to medium size, such as a Volkswagen “Golf”. 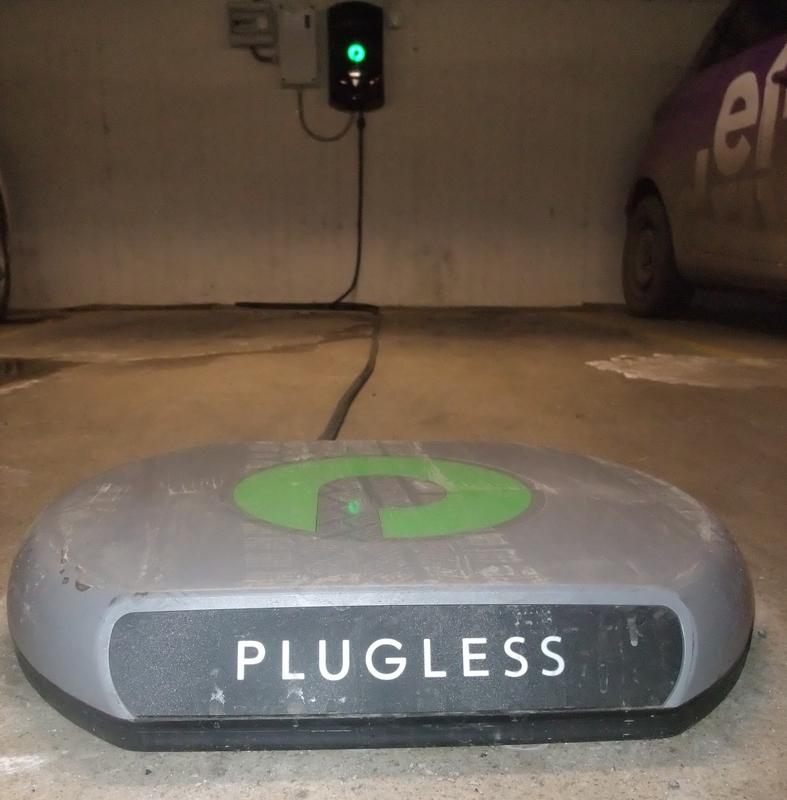 Cars in a larger category such as electrically fuelled service vans with a longer range are not currently available. Therefore the city has had to find alternatives such as gas fuelled vans until better options are available. 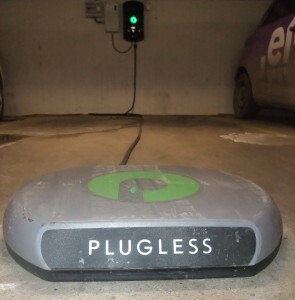 One reason that the amount of electrical vehicles in the present fleet is relatively low is because the city is reducing the amount of cars and choosing to use the them for a longer period. Consequently the city is currently buying less cars which is both economically and sustainably beneficial! Fuel targets. 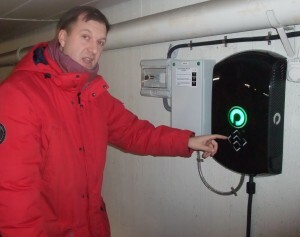 Stockholm has set fuel targets to encourage employees to tank with renewable fuels such as gas or ethanol. There is a bi-annual follow up on all fleet vehicles. Increase electrical vehicles. Stockholm has set a goal to increase the portion of electrical vehicles by 2% a year. Stockholm fossil free 2030. Stockholm city has set an overall target, in accordance with the Swedish national target, to be fossil free by 2030. Johan explains that big changes will have to be made, all vehicles of certain types with a 10 year lifespan will have to be electrical from 2020. He mentions large trucks as an example. 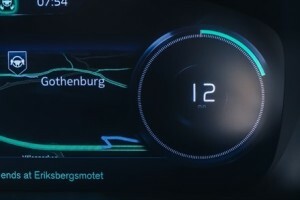 What else is Stockholm doing to make the fleet greener? Reducing the vehicle fleet. The city is purchasing less new cars and encouraging employees to walk, cycle, use public transport or carpools. Thanks to the initiative the city has been able to reduce the amount of cars in the fleet with 400 vehicles since 2007. Encouraging increased movement by foot, cycle and public transport. The City is actively encouraging employees to walk, cycle and use public transport in the line of duty. The City is joining car-pools. Johan says that several city departments have joined a car-pool (Sunfleet). The car-pool owns the cars and civil servants and other customers handle their own reservations, pick-ups or drop-offs through a mobile App. -The beauty in this system is that city employees use the car-pool vehicles during office hours and private individuals are the main customers at other times. It’s a perfect example of effectively used vehicles as they are seldom unused and serve several people’s needs instead of just one, says Johan. What other car fleet improvements can we see ahead? 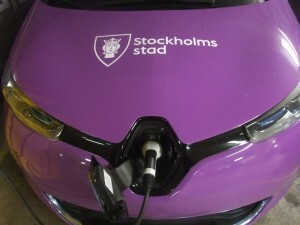 Stockholm City will continue the work of reaching current targets and increase the amount of car-pool usage. Johan foresees that new types of vehicles could come in use and mentions electrical bicycles or smaller electrical vehicles such as Renault Tweezy or Toyota iRoad. These two vehicles are still very new and untested by the city. 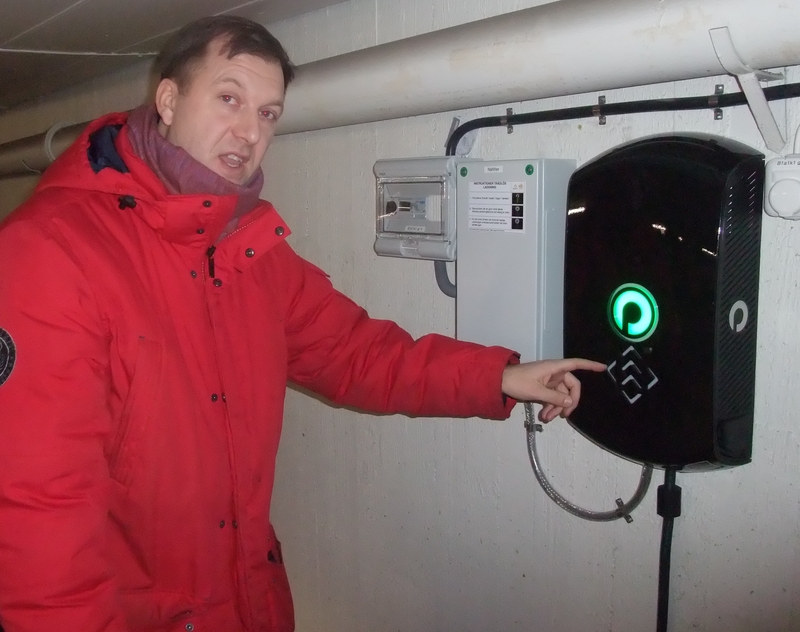 With Johan’s vast knowledge I ask him for his view: Are there are any excuses left for a private person, in order to buy a new car, not to choose an electrical car? -The question is if one should buy a car at all? 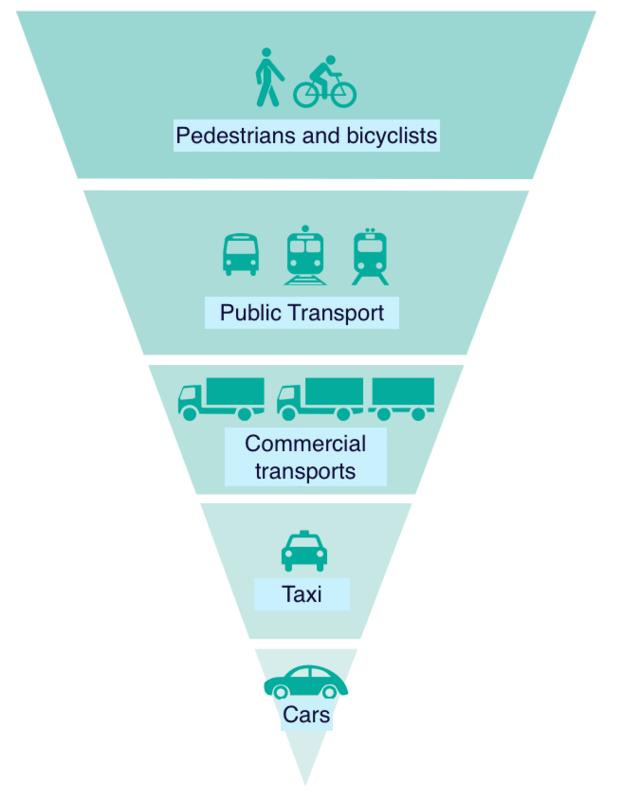 It would be better if we could all use the alternatives; public transport, car-pools, walking and cycling. If one needs to go on a road-trip then one can rent a car for the specific trip. I think to myself that what sounds radical today might be normal in everyone’s life in a couple of years. At the end of this interview I am feeling happy as my city, Stockholm, is moving in the right sustainable direction! 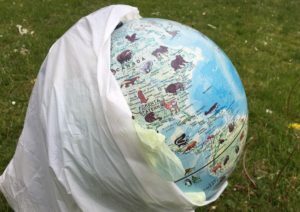 Next week: We meet 20 people from around the world to hear what they are doing to save our planet! Let us notify you when the article is available, click here! Can Earth be saved?City PlanningCommunityCommunity planningFuture CitiesFuture CityGreen car fleetGreen trafficImprovements of communityImprovements of lifeLarge populationPopulation growthReducing carsReducing trafficStockholm CitySustainabilitySustainable citiesSustainable citySustainable communitiesSustainable communitySustainable livesSustainable StockholmSustainable trafficTellus Think TankTellusThinkTankTellusThinkTank.comTraffic planningUrban Planingurban planningwe can save Earth! 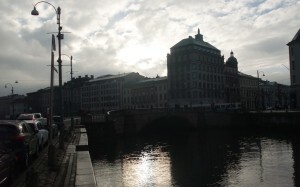 I grew up in Stockholm and love this city for several reasons! It’s not only a beautiful city, close to nature, but it’s the place where I went swimming during the summer, my parents taught me to bicycle and I spent most of my work life. Now I am watching my own children grow up here. The city has changed a lot since my friends and I played in the calm streets of our neighborhood, with no cars present. We played tag, jumped with skipping-ropes, played land hockey and climbed trees! The children of today have little room left to play as the streets are full to the brim with parked cars and aren’t safe with bypassing traffic. Consequently, children play more indoors and often with their computers, a situation shared by children in urban societies all over the globe. A while back Tellus Think Tank met David Beeton, founder of Urban Foresight. The British company helps cities plan for a more sustainable future traffic situation. After this meeting we wondered about what was being done to improve traffic in our own hometown, Stockholm. Read about David Beeton and Urban Foresight here! This week Tellus Think Tank meets with Daniel Helldén, the current City Commissioner of Traffic in Stockholm and elected as a representative of the Green party of Sweden. Next week: We meet Stockholm City Fleet Manager, Johan Seuffert, would you like us to notify you when the article is available, click here. 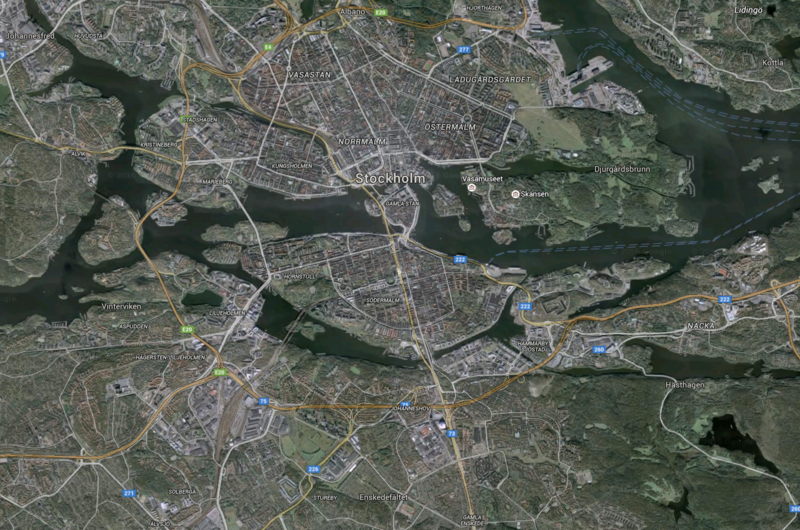 Stockholm from a Google Earth perspective. Stockholm was founded on the Island of Gamla Stan over 700 years ago. The island is one of many in a cluster of islands in the eastern part of lake Malaren. The region has since grown and the city is now spread over several islands and onto the mainlands north and south of the lake. The region has a population of 1.8 million people. Daniel Helldén represents the most central part of the city with 900 000 inhabitants. Stockholm is growing rapidly and estimates show that the central parts will be expanded with another 140 000 inhabitants during the next eight years. dominate the cityscape and the character of the city. At times cars and buses stand still in the daily traffic queues. Peak hour traffic is expanding over a longer period as more people drive their car to work and try to avoid the queues by leaving earlier or later. On Friday afternoons weekend traffic starts as early as 13.00 PM. Daniel Helldén, City Commissioner of Traffic, is responsible for all roads, pavements and bicycle paths in the city. The regional council, another organisation, is responsible for the public transport vehicles. Daniel Helldén, thank you for meeting Tellus Think Tank and our readers! You have been Stockholms City Commissioner of Traffic since the elections in the autumn of 2014. What were your initial ambitions for improving sustainability of the traffic situation in Stockholm? My ambition was and still is to improve the sustainability of Stockholm which demands many changes in the infrastructure of the city, so that traffic by foot, bicycle or public transport is prioritized instead of car traffic. There is a common understanding about this that is shared by all parties in Stockholm. I would really like to make a difference in this area, which will include decreasing traffic by car and contributing to the Swedish national climate targets. 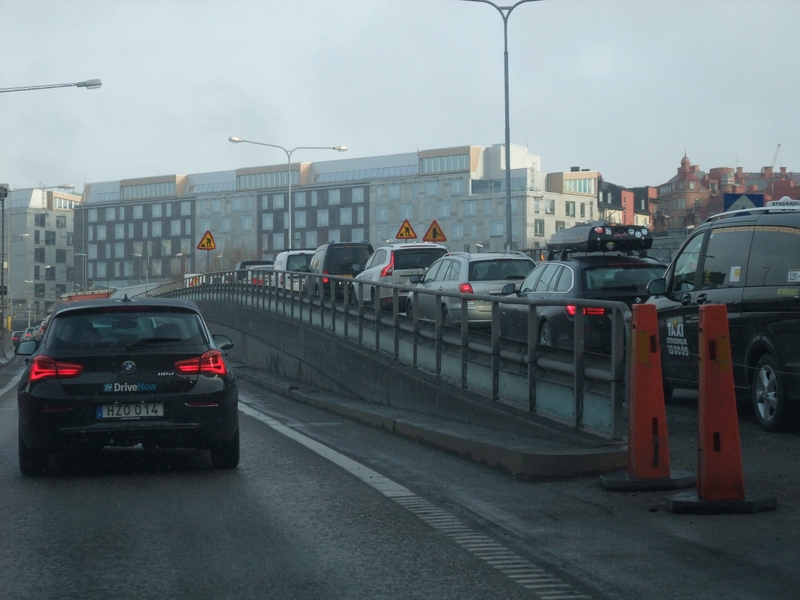 What are the biggest challenges in the Stockholm traffic situation, from a sustainability perspective? Cars emit both poisonous particles and greenhouse gases. The amount of cars in the city corks traffic, extends commuting time and also claims a lot of living space that could have been used better. The amount of cars in Stockholm today makes the city unavailable, not just for drivers but also for bicyclists and people on buses. The space that cars claim when driving and parking could be used for bicycle paths, bus lanes to enhance the speed of commuter traffic and for cleaner pedestrian paths. We would like to improve the living space of the city so that traffic flows better, people can spend time outside and walk or take their bicycle to work. What progress has been made during your first year as City Commissioner of traffic? what changes can be achieved in just a year? Daniel has some early improvements to share, either implemented or in the planning stage. 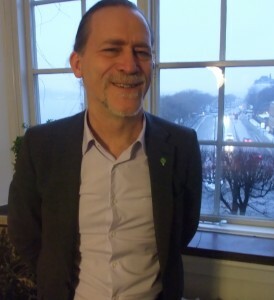 Daniel talks about a general understanding between all political parties in Stockholm, however other people say that “the Greens” are very driving in matters of improving the sustainability of the city. New boat line. Today, says Daniel proudly, is the opening of our new commuter boat line that runs between two of Stockholm’s central islands. Now pedestrians and bicyclists need not walk miles around the waters of the central city but can instead use the city’s new boat line! 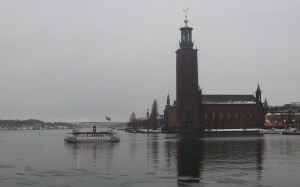 The boat line is the result of cooperation between the County Council and Stockholm City. Euros on expanding the bicycle path infrastructure and making it safer. 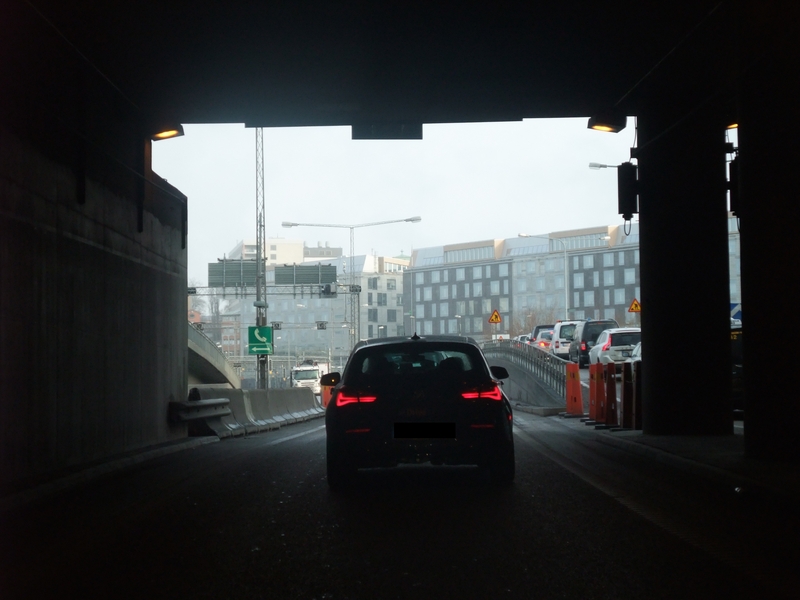 Several roads and parking places are being removed from the city because of bicycle path expansions – Daniel mentions streets such as Norrmälarstrand, Skanstullsbron and other areas under planning. Increasing the speed of public buses. Because of the amount of traffic and cars parked in the streets the average speed of public buses is currently only 11 km/h! Several steps have been made to increase their speed such as more bus lanes and changing intersection traffic signs and directions so that cars don’t slow down the bus traffic. Some roads have been closed to private cars all together. Increasing pedestrian areas. 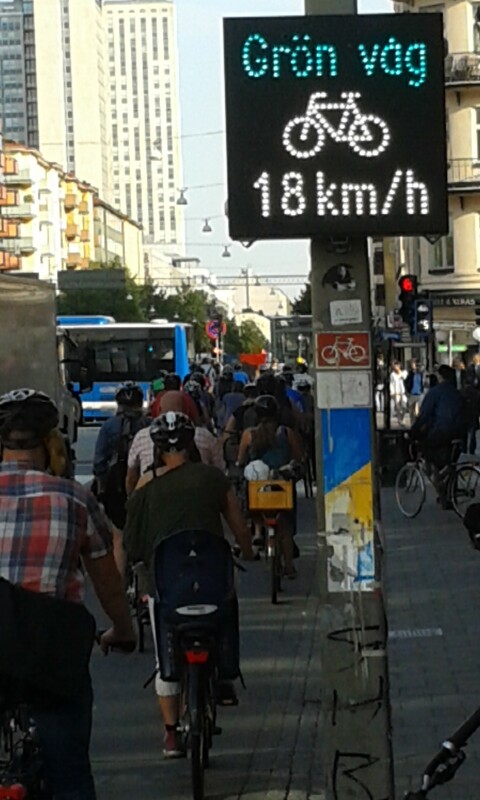 During the summer of 2015 experiments were made to try and increase the street life in the city and two streets were closed off to traffic, Swedenborgsgatan and Skånegatan. The purpose was to increase livability and street life of the areas involved and create more sustainable spaces for city dwellers. We find the developments that Daniel has spoken of so far are inspiring and interesting and see how they could help lift the quality of living in Stockholm. 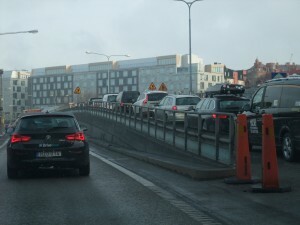 What will Stockholm do to improve sustainability of the traffic situation further? Continued investigations. 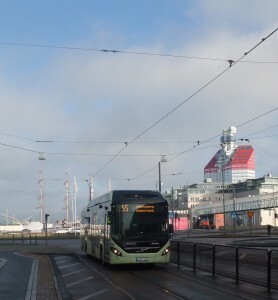 Several ongoing investigation will lead to a more sustainable traffic situation for the inhabitants in the expanding city and will help Stockholm move towards improved public transport, pedestrian- and bicycle traffic. Increasing the possibility of street life in the city during the summer of 2016. Being wiser from the experiments during the summer of 2015 Stockholm will close even more streets to traffic during the summer of 2016. Daniel mentions areas that might be affected: Swedenborgsgatan, side streets to Biblioteksgatan, Humlegårdsgatan, Rörstrandsgatan and Skånegatan might be on the list again. strategy being developed. He hopes the formal decisions will be made during the summer of 2016. The strategy will most probably suggest implementing parking fees in the more central suburbs of Stockholm. Why are parking fees needed in the suburbs? 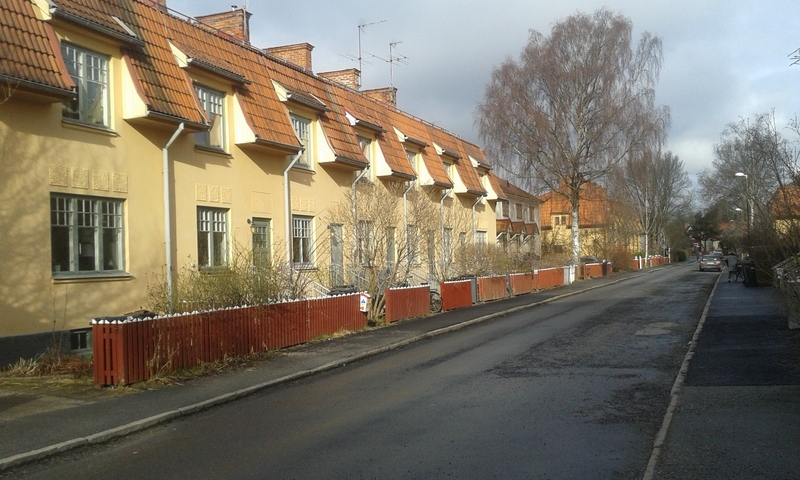 The current urbanisation process is making Stockholm grow rapidly and the building of new dwellings such as apartment houses needs to continue to house the expanding population. By decreasing the amount of parking in conjunction with new estates costs of building can be lowered and the space can be used for bicycle garages, car pools or even more residential homes. However, when new estates are built without parking lots the risk is that cars are parked on the streets instead. 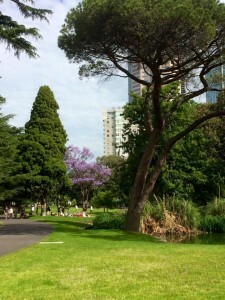 This leads to a slower traffic pace and less space for pedestrians, bicyclists and public transport. Introducing a fee on street parking promotes use of public transport and bicycles. It seems like there are many good initiatives going on to improve the sustainability of the Stockholm traffic. Daniel, which three initiatives would you prioritise during this term, 2014- 2018? bicycle paths be implemented on streets with many bicyclists. We want Stockholms bicycle infrastructure to feel safe, all year around and have a plan to make it happen! 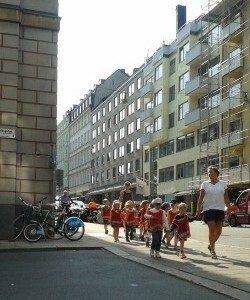 We’d like to see Stockholm street life and cityscape become more lively during the summers as an effect of closing of car traffic in certain areas and implementing a pedestrian plan for the city. We want to increase the average speed of public buses from 12 to 20 km/h. It doesn’t sound much but is an ambitious project. I would like Stockholmers to trust that public transport will get them to their destination on time. Tellus Think Tank thanks Daniel Helldén for an inspiring meeting. We hope that Stockholm is able to continue on the path towards more sustainable traffic situation that makes a more lively cityscape possible. 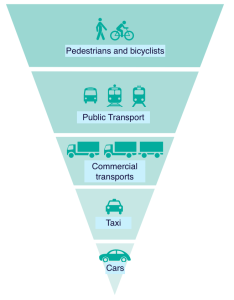 The Stockholm approach to the traffic pyramid might change the city in ways we would never have thought off! 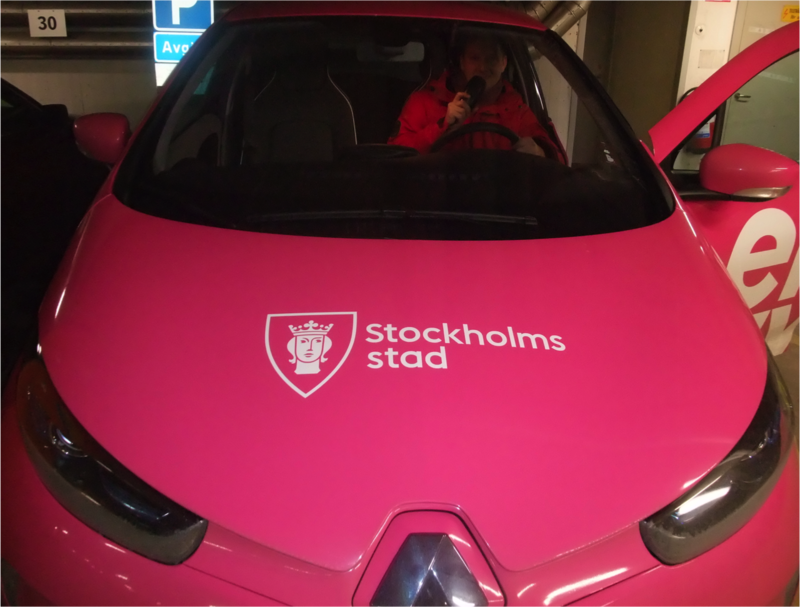 Next week: We meet a civil servant of Stockholm, in charge of the city car fleet! What is done to increase the sustainability of the car fleet without having to decrease citizen service – would you like us to notify you when the article is available, click here. Can Earth be saved?City PlaningCommunityFuture CitiesFuture CityGlobal WarmingImprovements of communityImprovements of lifeLarge populationPopulation growthStockholm CitySustainabilitySustainable citiesSustainable citySustainable communitiesSustainable communitySustainable livesSustainable StockholmSustainable trafficTellus Think TankTellusThinkTankTellusThinkTank.comUrban Planingwe can save Earth! Last week we had the pleasure of investigating living in homes on wheels, this week we further investigate alternative ways of living in Skattungbyn, Sweden. 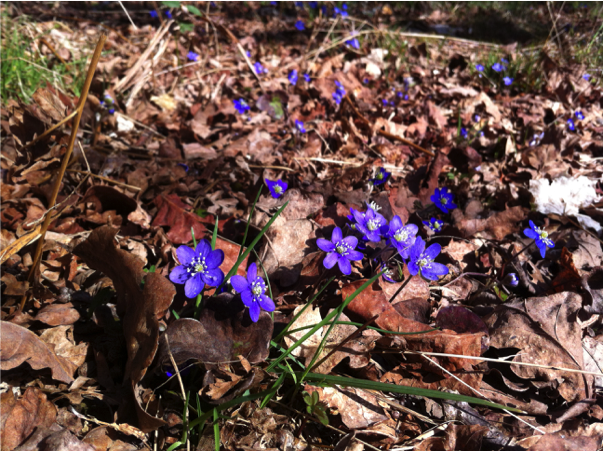 Maybe you will find something in Skattungbyn that might inspire a change in your own life? 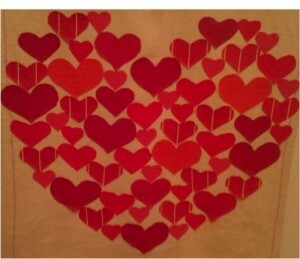 Text: Domi. Photo: Agata Mazgaj, AnnVixen, Daniel Zetterström. Tellus Think Tank 2016-02-17. Mora Folk School. After having finished the course, some remain in the village and keep exploring alternative ways of living. A person in Skattungbyn can live for less than 200 Euros a month, including rent, food and phone costs – further ahead in this article. In most parts of Sweden the normal monthly rent for a one roomed apartment would be between 300-700 Euros, food costs of about 150 Euros per person to be added. City life is much more expensive! Several people in Skattungbyn have chosen not to work full time or have more radically decreased the amount of hours they work a week. 8 hours work, 8 hours sleep and 8 hours for organising one’s life so one can keep on working – i.e. picking kids up from school, commuting to and from work, cleaning, washing and shopping. How can the differences be so big between a group of people in the village of Skattungbyn and the rest of the western world? Land is cheaper than in urban developed areas. Markus Skoog, 34 years old, left the rush of the city for an alternative life in Skattungbyn. 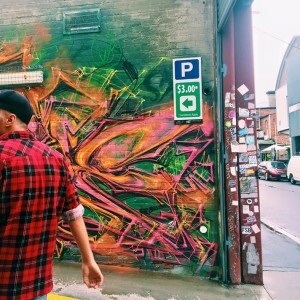 He grew up in a suburb of Stockholm and soon understood that his high school teacher’s diploma would never enable him to buy his own apartment in the Stockholm area. He changed course and started off as a carpenter’s apprentice and was soon making more money but the life he led, building small exclusive apartments in the city, didn’t give him the satisfaction he was looking for. 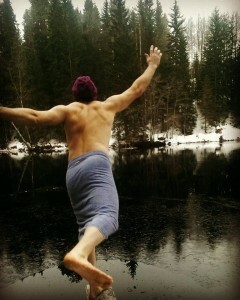 Markus searched for ways of living closer to nature and shortly after was accepted to the Mora Folk School. The course at Mora Folk School followed the farming year and started in January, continuing throughout the season. Sessions were held in growing and preserving food, how to eat more nutritiously and lessons in different crafts such as weaving and making homespun clothes. 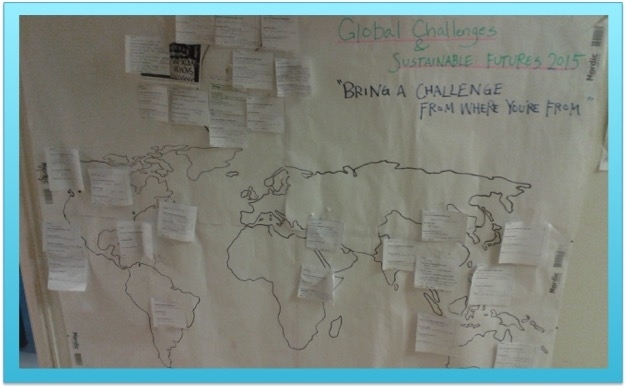 The pedagogical narrative of the school is sustainability and global human rights. -During the course, my fellow students and I came to understand just how much work lays behind just one t-shirt sold by the retail industry, says Markus. 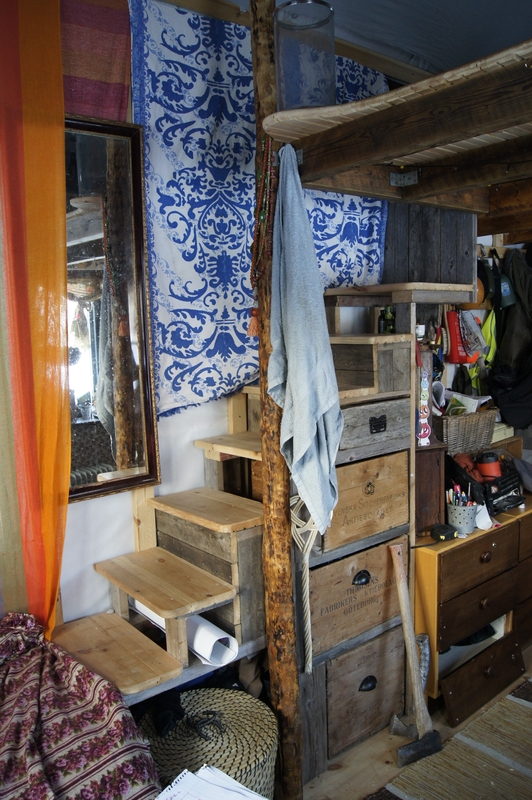 Markus initially moved into the dorms of the school dorms but soon he and a couple of other fellow students decided to build their own homes on wheels, according to the Skattungbyn-way. The most important lessons for Markus where on how to grow food and living in collectives can not be done successfully with just anyone. One needs to be selective when choosing with whom to live. 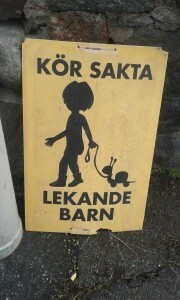 What kind of people have chosen to investigate alternative ways of living in Skattungbyn? 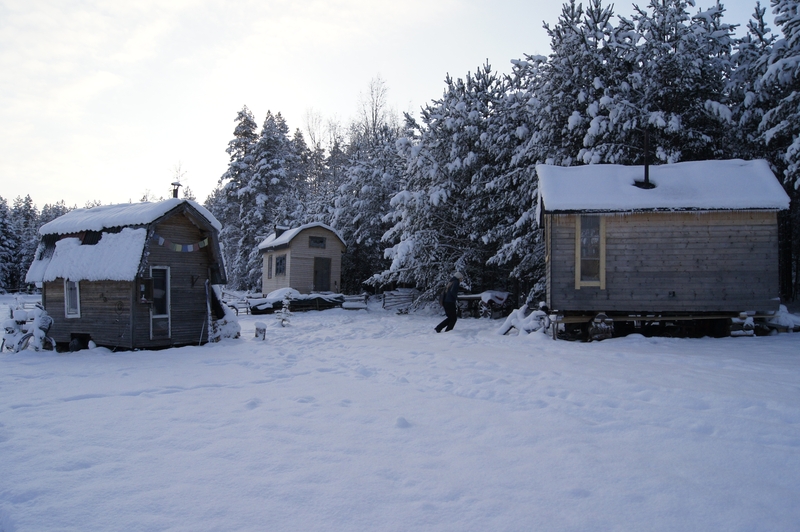 Skattungbyn villagers that investigate alternative ways of living have often attended the Mora Folk School. Markus first calls them “hippies”, “greens” or “alternatives” but in the next breath he says people are difficult to group. Persons that after school succeed in finding a job in the area often stay. They start off living in the dorms at the school and some move into Tiny Homes on wheels, others buy their own land. After a couple of years most look for a somewhat more spacious way of living and often keep a strong alternative focus in their lives. Orsa Finnmark and herds her sheep on the mountain. 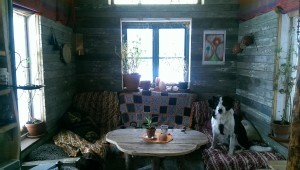 Anna recently built out the old farm with an orangery that gives her lemons in the midst of winter! Markus tells me about the 86 year old woman who down-sized as she got older and moved into a home on wheels to avoid an old peoples home. her. 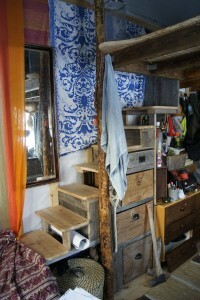 She only had about 7 m² which gave her space for a bed, a small cabinet and a wood stove. She lived there without electricity and running water and loved it! Markus has his home on wheels on a plot of land that belongs to FrejaLina. FrejaLina recently bought the estate of Flurlundar farm and started a collective on the property. Today there are five persons living in the mother house of the estate and another four residents that live in their own homes on wheels. Some of them have access to electricity and fresh water, and some of them live totally “off grid”. Life at Flurlundar farm reminds me of my university dorm where we also had a very positive fellowship community going on with film evenings etcetera. There are several differences here such as, members of the collective are involved in their community farm and also take turns in cooking vegetarian dinners for each other. There are no children in the collective, yet. One person owns the dog, Birk, that is one of the most cherished dogs I have ever seen – he has a lot of different people to take him for a walk! 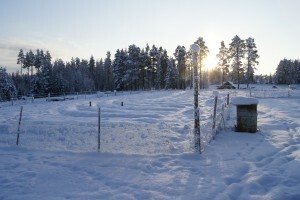 Most of the people who have chosen an alternative lifestyle in Skattungbyn eat vegetarian and buy or grow their own food. Markus tells me that there are some that dumpster dive for their food, meaning that they “dive” into dumpsters behind food stores for food that has past its best date. Markus avoids dumpster diving as some locals find it annoying. He was once invited to a friend for a really lovely salmon ceviche dinner, and learnt that the salmon had been found in a dumpster! Are the alternative of Skattungbyn idlers? Skattungbyn is becoming known to be “hippie” and is famous in the Swedish alternative circle but the village also has a lot of inhabitants that do not count themselves as “alternative”. Markus says that there are some prejudiced ideas circling about the alternatives, such as that they probably idle and live on welfare. He strongly opposes this. 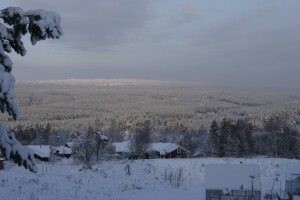 Markus says that it is possible to live very inexpensively in Skattungbyn, if one wants to, and that neither a full time job or welfare is needed to survive. A friend lived during a longer period for under 50 Euros a month. How could he do that? He took care of people’s houses when they were abroad, dumpster dived for food, worked for food doing things like chopping wood. One job gave him a couple of Euros that he put used for his mobile phone subscription. -It is difficult for some to understand that such inexpensive living is possible, says Markus, which might lead some to believe that welfare is in the picture, which it is mostly not. Some people he knows work a couple of hours a month in the Folk School and live for under 200 Euros a month. 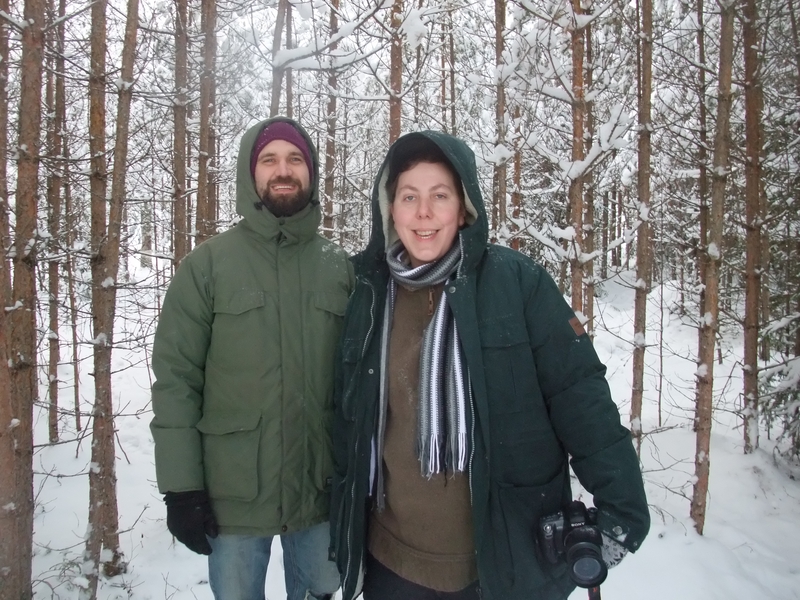 Markus lived with costs less than 180 Euros a month, during a period. Costs included rent for his Tiny Home on wheels, electricity, water, mobile subscription and food. -Vegetarian drygoods are pretty cheap, Markus explains with a smile! Today Markus works fulltime at a refugee camp in the neighboring village of Orsa and estimates that his monthly living costs have increased to 500 Euros as he needed a car for work. Some of his friends also work at the refugee camp and others work at the local hospital or in youth care. 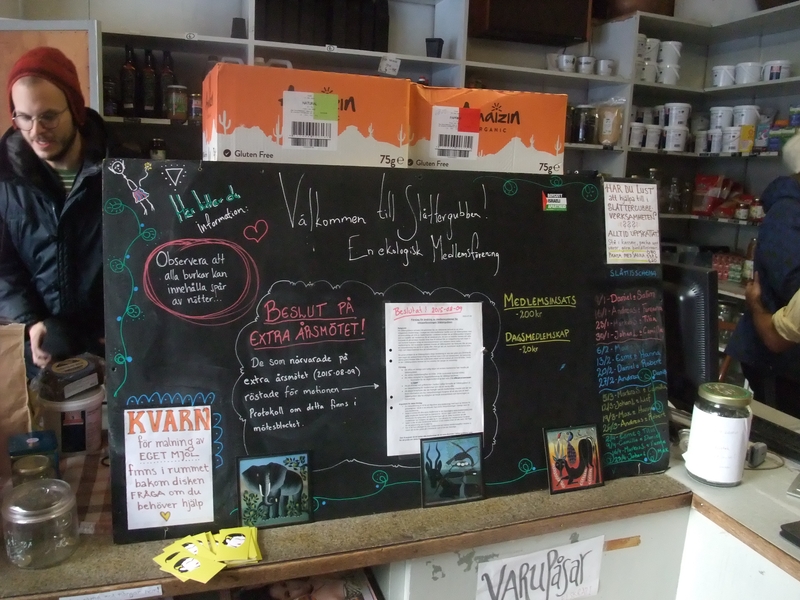 There are several “shops” in Skattungbyn and none of them can be considered normal but they all help the inhabitants to live more inexpensively! Skattunge Handel was once the only food store of the village but was deemed unprofitable and about to be closed. To avoid having to drive 15 miles for food or gas the villagers took over shop and founded a cooperative association. Today the shop holds the same assortment as a small food store. It has employees to run it but much of the administration is done by the co-op members. Slåttergubben is the second food store in the village. It is also co-owned by some of the villagers but classed as a procurement association. 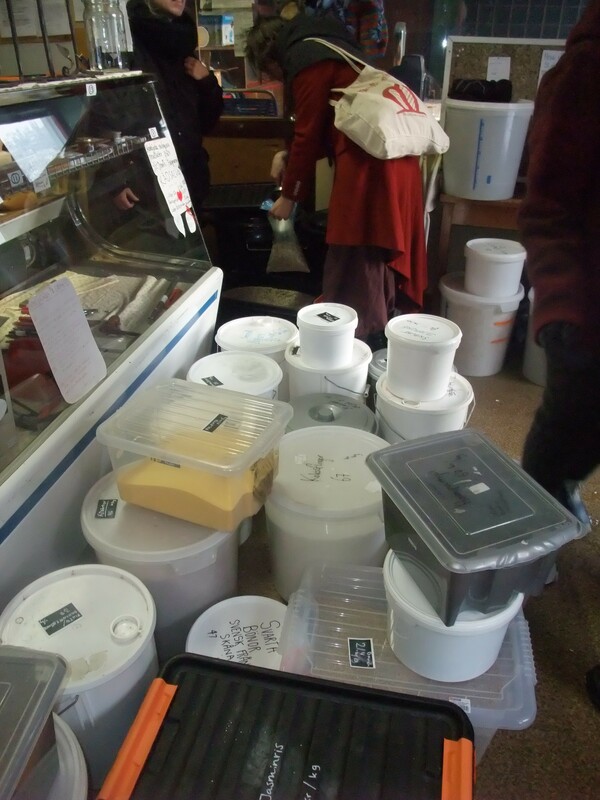 The shop buys large sacks of locally grown food or European organic food. Customers bring their own packages to fill. 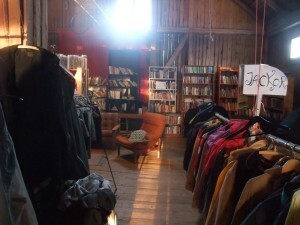 The shop is very much cheaper than a normal store. It is only open between 13 pm and 15 pm on Saturdays so that it doesn’t compete with Skattunge Handel. The village is too small for competition but big enough for cooperation it seems! Hansen’s House is run by the Swedish study association for study circles and theatre groups. 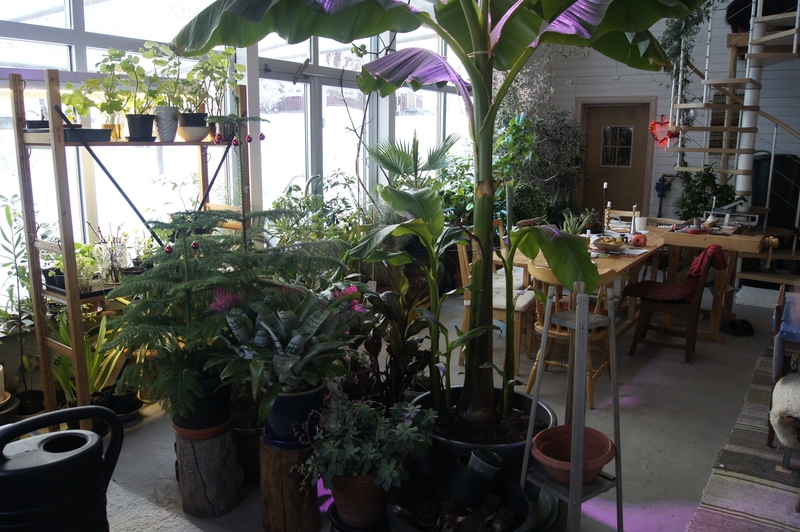 On Saturday afternoons Hansen’s House becomes a meeting places for the alternatives of Skattungbyn they then hold a “folk kitchen”, serving vegetarian meals to anyone that might be interested. The kitchen is financed by donations from both guests and donors. currently has chosen to organise the Free shop, it looks absolutely lovely and pittoresque! Interestingly enough, all of the shops in the village are non-profit making and run either by a cooperative or by driving spirits helping other villagers to a more inexpensive life! 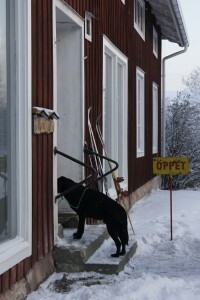 Some people in Skattungbyn do their Saturday shopping tour by first visiting the two food shops and then passing the Free shop to either pick up or leave stuff off and then continue to Hansen’s House for a meal. The latest news is the recently opened tool library where villagers can borrow good quality tools. 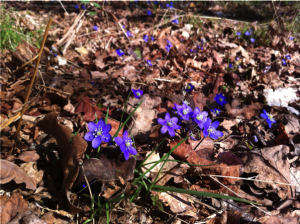 Markus started the blog “Att Leva det Levande Livet”. -Because “life must be able to be better than this”, he smiles! He wanted to document his own learnings of alternative living and share it with others that might be interested! cabbage, kale, artichokes, onions, squash, pumpkins and potatoes. They also built a greenhouse, “The Dome”, to be able to grow their own chili, basil, cucumber and tomato. A second greenhouse will soon provide the collective by providing the possibilities of biannual crop rotation to avoid pests. Most of what they know about growing food was learnt from their very appreciated teacher Patrik Ytterholm at Mora Folk school. Will Markus always live like this? gain a passive income from rent. He doesn’t mind working but wants to do things that matter to him such as giving a course this summer on how to build you own Tiny Home on wheels! The visit to Skattungbyn has been an eye-opener showing that life can be more free and not so structured as life often is in urban areas. There are of course pro’s and con’s with every lifestyle but Tellus Think Tank is happy to understand this alternative! Next week we investigate the development of Stockholm as a green and environmentally friendly city from a traffic perspective, would you like to be notified when it is available, click here! Alternativ livingAlternative livesCommunityDown-sizingHippieImprovements of communityImprovements of lifeSmall homesSustainabilitySustainable communitiesSustainable communitySustainable livesSustainable schoolsTellus Think TankTellusThinkTankTellusThinkTank.comTiny HomesTiny Homes on wheelswe can save Earth! the need to commute to work or school? 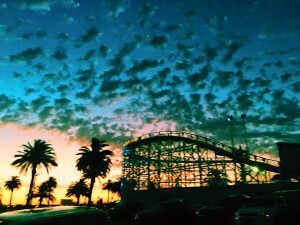 Do you ever wonder if life could be lived differently? From the 70’ies until today at least 200 people have had the same thoughts as you and moved to the small village of Skattungbyn in the rural district of Dalarna in Sweden. My friend Agata and I often have long discussions on everything from sustainable living to Swedish media and Polish politics. One day she told me about a Swedish blog she found on the theme of living in small quarters and in this way making as small a footprint on our planet as possible. Would this be a life for us? 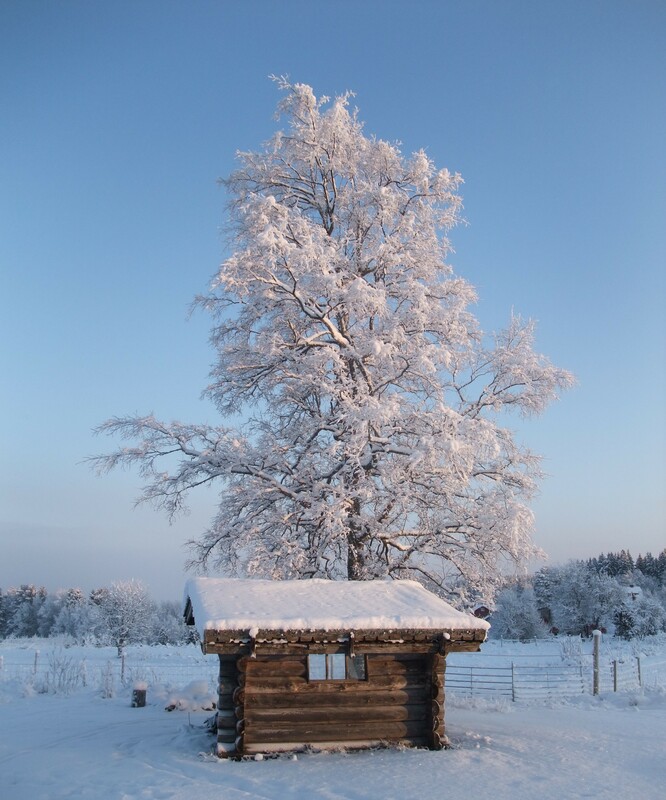 All of a sudden we are on a road trip to Skattungbyn in the Swedish district of Dalarna, tag along! The roads are empty when we drive into Skattungbyn this sunny, frostbiten Saturday morning in January. We get to experience the village in sunlight as it clutches on to the hillside with a fantastic view over the nature of Orsa Finnmark. This at once feels like a harmonious place, a feeling that endures through our full visit! In the village of Skattungbyn one can find a rather unique way of living, Tiny Homes on wheels. 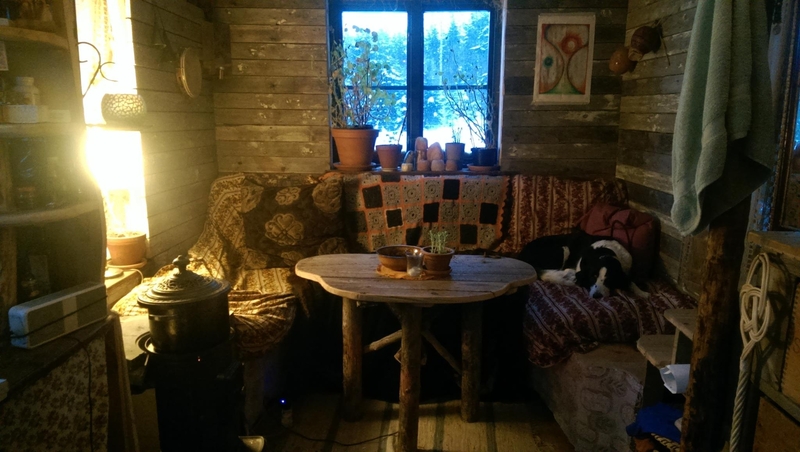 We have the privilege of meeting Markus Skoog, that some here would say personifies, thanks to his blog , “AttLevaDetLevandeLivet”, the Tiny Home dwellers. 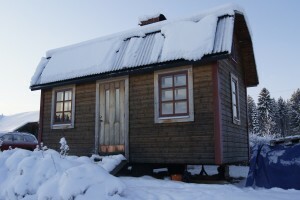 The first Tiny Home in the village of Skattungbyn was built in the beginning of the 2000’s. 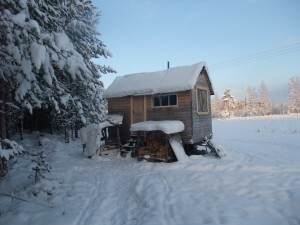 There are currently 20 people living in Tiny Homes in the village and the word is spreading throughout both Sweden and the world. The people that build their own Tiny Homes on wheels later seek permission from a landowner in the village and roll their home onto the designated part of the land. The rental agreements differ from situation to situation. Also read the next article about Skattungbyn and the community there, it will be available next Thursday! Would you like to be notified, click here. Why live in a Tiny Home on wheels? 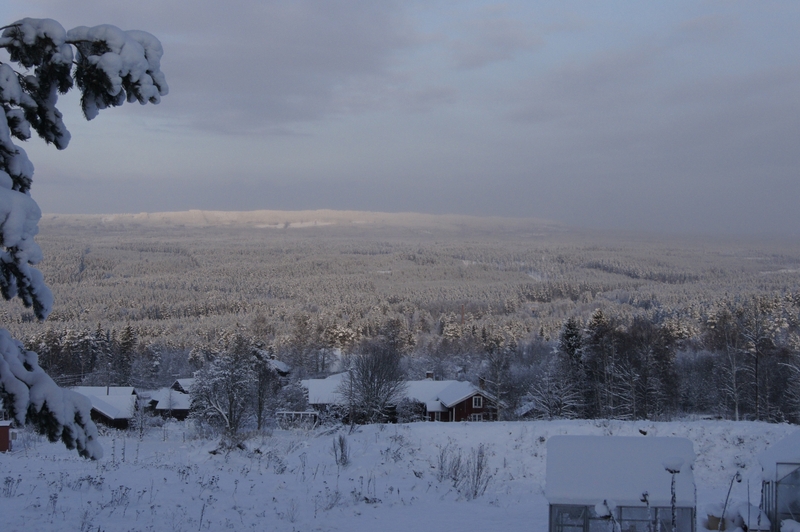 One reason is that Skattungbyn is a lovely place to live but it is difficult to find land to buy in the village. Another reason is that living in a Tiny Home on wheels makes a very small dent on nature and a very small carbon footprint as the houses are not attached to the land and don’t use concrete. Living in a Tiny Home on wheels is easy and simple and a way to live an alternative life. A third reason is that it is very cheap to live in a Tiny Home on wheels. Read more about costs below. What I find the most interesting is the insight that it is possible to live so much cheaper than we currently do in the city, and it isn’t hard to come by this simpler life. Depending on how the perspective living simpler might even bring a higher quality of life? Ofcourse, there are pro’s and con’s connected to every way of living! The Swedish Tiny Homes on wheels differ a lot from the American Tiny Homes. Markus tells us that Tiny Homes in the US want to hold their distance from the trailer people and that they pretty much squeeze every comfort into their Tiny Homes, at almost any expense. -The kitchen areas in the US Tiny Homes cost a fortune even though the size of the houses are very small. Also, every Tiny Home in the US has a toilet and a shower. They look like normal houses in a mini format. The Swedish Tiny Homes on wheels are all about living simple. 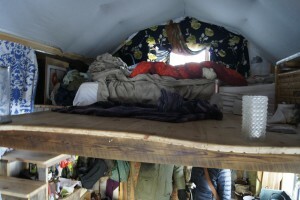 coming winter season he borrowed his friend Lorraia’s Tiny Home, which he smilingly describes as a “glorified tent” as the house was very badly insulated. 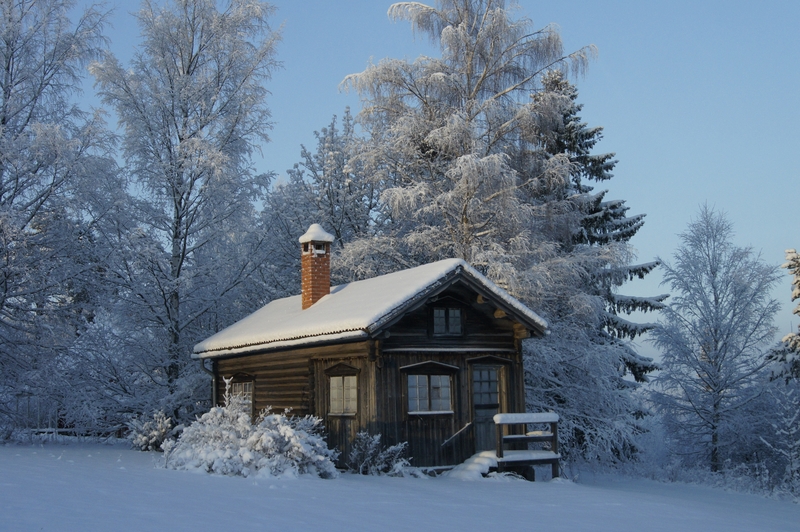 The heating system consisted of a wood stove and when Markus came home late at night it would be so cold that he would have to be quick to light the wood stove fire, jump into his sleeping bag and fall asleep. 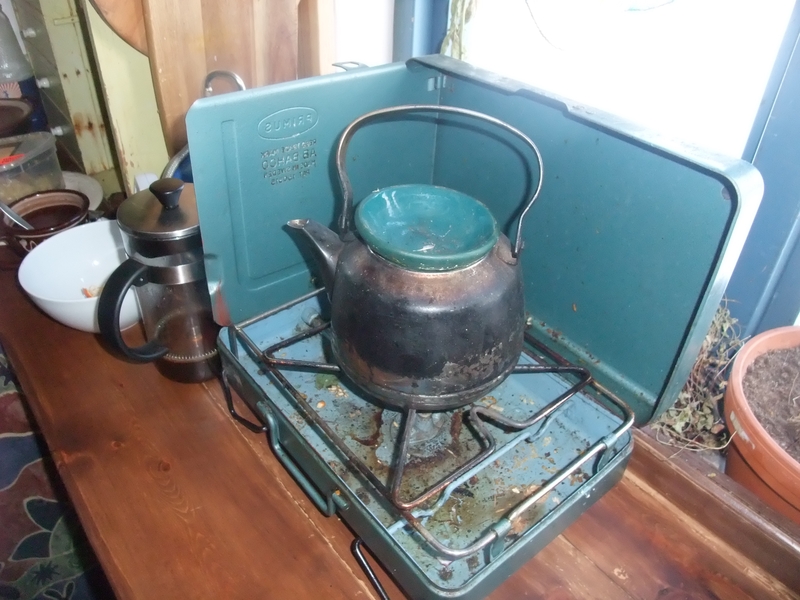 After a while he found that he could heat water on the wood stove and pour it into plastic bottles that he would snuggle into his sleeping bag to keep the heat during the night. 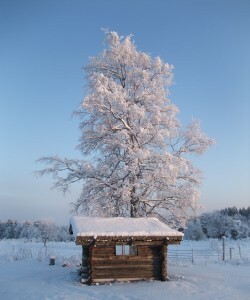 After that particularly cold winter Markus felt a strong urge to build his own, well insulated home. 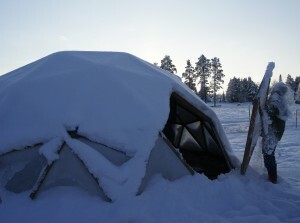 The day Agata and I visit Skattungbyn we read -17°c / 1,4°f and we understand how important insulation is in this climate! 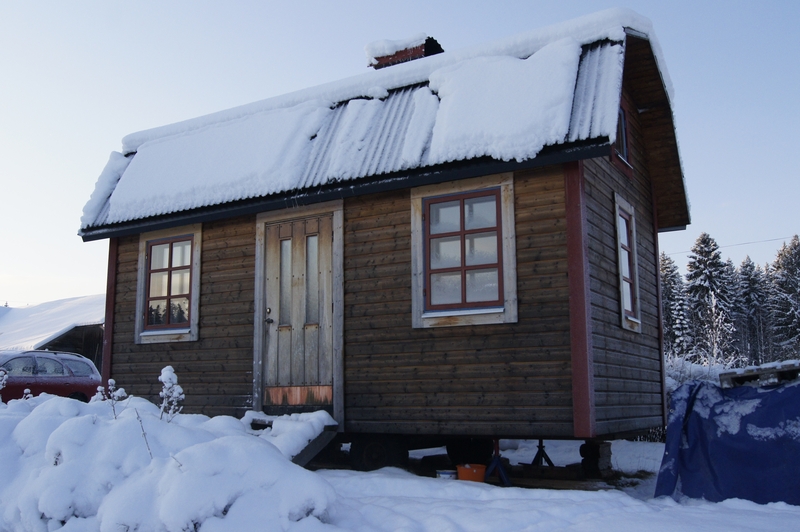 Markus’ new house, designed with a “broken” gable roof like the cutest Astrid Lindgren cabin, is very well insulated! The Tiny Home on wheels was built in 2013 and it took Markus about two months to finish it to the point where he could actually move in. He didn’t have everything in place from the beginning, and finished bits and pieces when he could afford it. In the beginning, until he was able to afford indoor paneling, he dressed the walls with colourful cloths! -It was lovely to finally get the panel in place, smiles Markus! The cost for the Tiny Home on wheels initially added up to 50 000 kronor / 5 000 Euro. 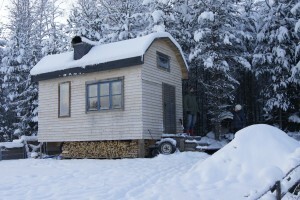 After having chosen to improve the quality of the house with a tin roof and some other comforts Markus estimates that he has paid about 80 000 kronor / 8000 Euro for his Tiny House on wheels. 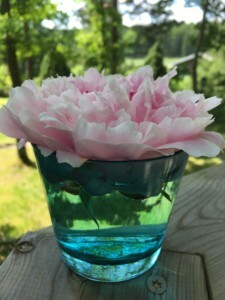 -I chose not to equip the kitchen part with a drain but there is a kitchen bench and I have a large pitcher of water and a large bowl for kitchen use! says Markus! 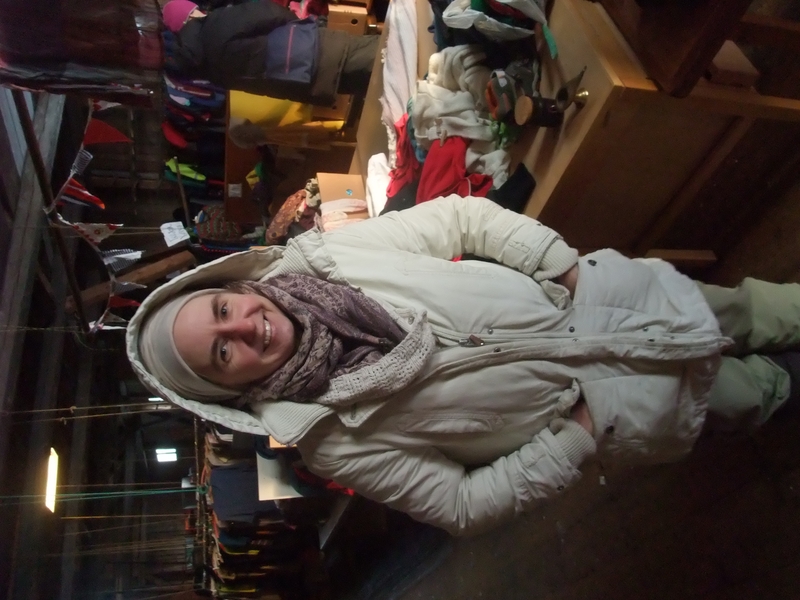 Agata and I are invited into Markus “one roomed apartment”. It feels airy, warm and minimalistically decorated. 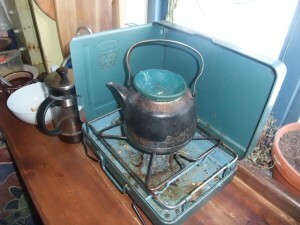 On the right short side of the room we find a kitchen bench, in the middle of the room the wooden stove is crackling. By one of the windows we find a second heating source, an electrical heater, that works since Markus has electricity installed. At the other end of the room Markus has built a wooden sofa covered with mattresses. From the sofa we can just make out an almost hidden ladder leading up to a so called mezzanine loft, half storey loft. That is where Markus has installed his sleeping quarters, just under the roof. Markus Tiny Home is 3.1 meters x 6.0 meters / 10 x 20 feet and it weighs about 6 tons. The height is 4.5 meters / 15 feet. The living space is 17 m² / 182 f² and the Home stands on wheels! papers are put into a large mill and blown into the space between the columns of the walls of the house. The newspaper insulation works really well and is a much more sustainable alternative compared to Rockwool or such, says Markus that is a professional carpenter! The Tiny Home, just like the other Tiny Homes in Skattungbyn, is built on boat trailer wagon structures or similar. Markus chose to build his Tiny Home on a two wheel wagon structure. 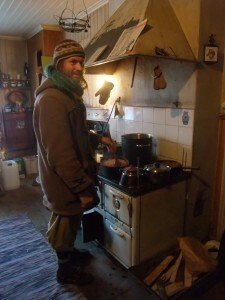 Most Tiny Homes here are built without drains and toilets but have possibilities for cooking on the wooden stove. Owners of the Tiny Homes on wheels can sign for a comprehensive household insurance allowing the Tiny Home to be moved twice during a year. Markus has films on youtube, with soon above 60 000 views, on how to build his Tiny Home. It is icy cold in Dalarna today and Agata and I have dressed accordingly but are still freezing when we move around the grounds to look at more Tiny Homes on wheels. Costs of the Swedish Tiny Homes on wheels differ depending on the type of material and the origins of the materials. Markus Tiny Home on wheels cost 80 000 kronor / 8 000 Euro. 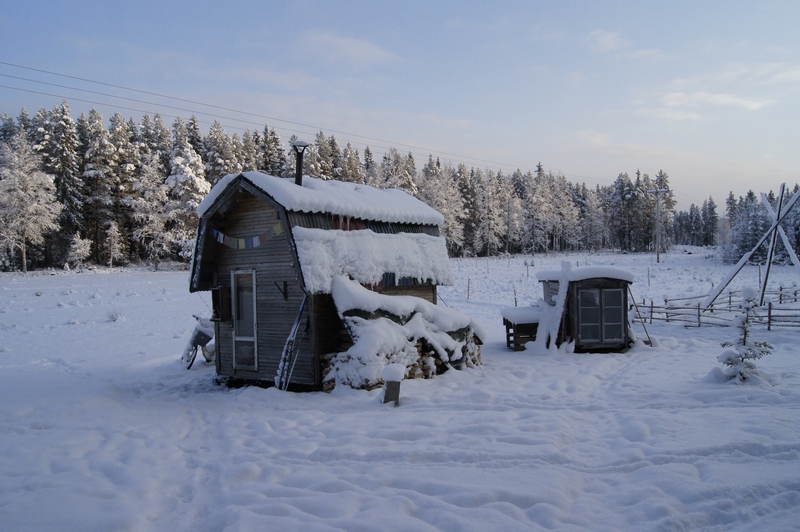 Flurlundargård, the farm that Markus house stands on, has another three tenants in Tiny Homes on wheels. 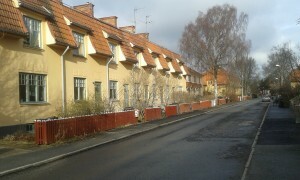 The other houses have cost far less ranging from 4 000 kronor / 400 Euros to 50 000 kronor / 5 000 Euros. The Tiny Home with the lowest cost was one where all the wood was donated from a de-construction site, total cost of zero kronor / zero Euros. Interested in running costs of life in a Tiny Home on wheels, read more in next week’s article, get a notification when it is available. If Markus would have built his house today, what would he have done differently? walls and a normal gable roof. He would also have built the house much smaller than 17 m² / 182 f² as the current house is a bit big for his personal needs and needs a tractor to move it! The current design places the wood stove in the middle of the room to match the aesthetically placed chimney, set in the middle of the roof. If he could re-do this he would have placed both the wood stove and chimney along one of the walls. 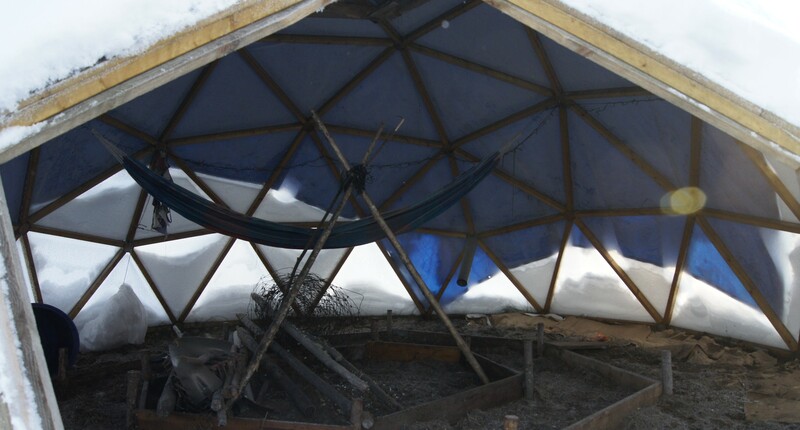 Markus has access to both electricity, a kitchen, a shower and fresh water in a tap system as he is camped on the land of and affiliated to the FrejaLinas collective, that locally goes under the name Flurlundar farm. 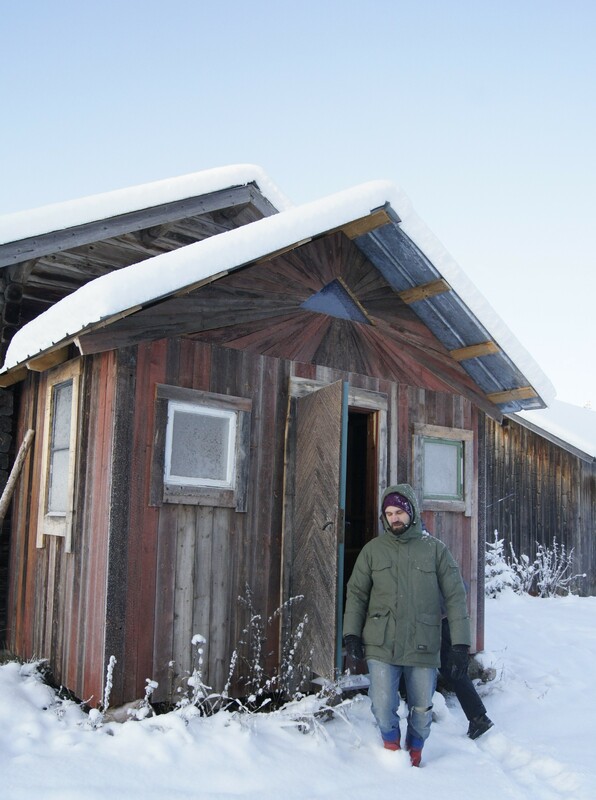 He estimates that about half of the Tiny Home dwellers in Skattungbyn do not have direct access to either electricity or water. -What, is it possible to live this way, I wonder curiously? How? 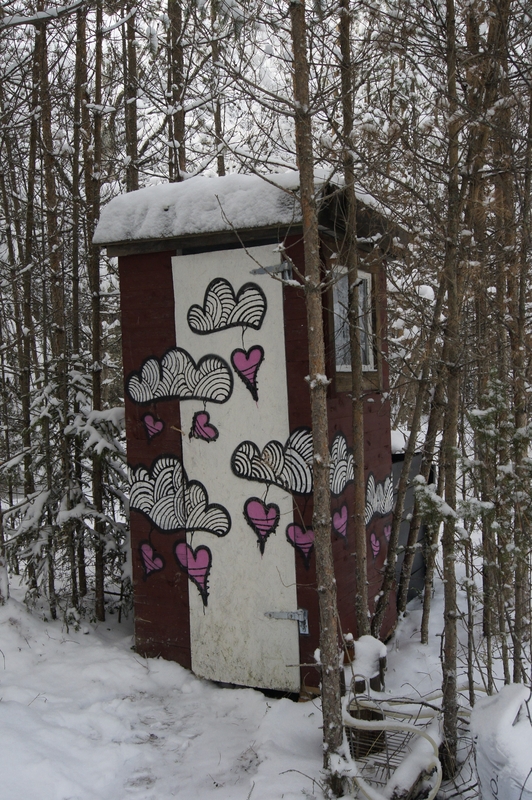 Markus says that most of the people that want to live in alternative ways in Skattungbyn have access to large plots of land and in some cases also to water toilets but they choose to build and use an outhouse. An outhouse, composted in a correct manner, is transformed by bacteria to very good farming soil in just two years. 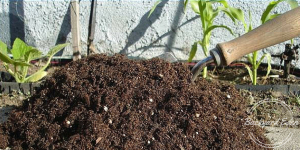 The soil can be used as fertilizers to farmlands or tree- and bush cultivations. 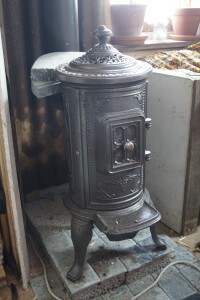 without direct access to water heat water on their wood stoves and wash with soap and towel at home. Water can be fetched from the snowy winter slopes or from many of the lakes and streams that run through the village during the summer. Almost everyone in Skattungbyn has a smart phone and if they don’t have access to electricity in their home phones are charged at work or with battery chargers. Markus is more of a flexitarian, as he eats meat if someone invites him to it. The Flurundar farm collective however cook all their meals together and only cook vegetarian food. Do you find that life in a Tiny Home on wheels differs quite a bit from other Western lives? Read more about the community of Skattungbyn next week. Do you want to be notified when the article is available, click here! October 1st, 2015. Tellus Think Tank is happy to meet Sachiko Ishihara, recent graduate and now Course Coordinator, at CEMUS in Uppsala University. I have already checked out the CEMUS website where they proclaim wanting to save the world! This makes me very curious! 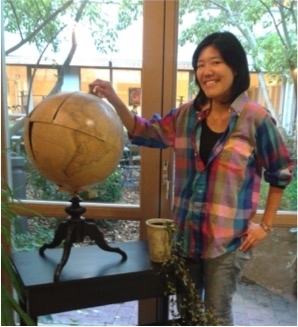 Sachiko Ishihara coordinates Global Challenges & Sustainable Futures at CEMUS. I meet Sachiko Ishihara an October day in the CEMUS-library of Uppsala, just north of the capital of Stockholm. 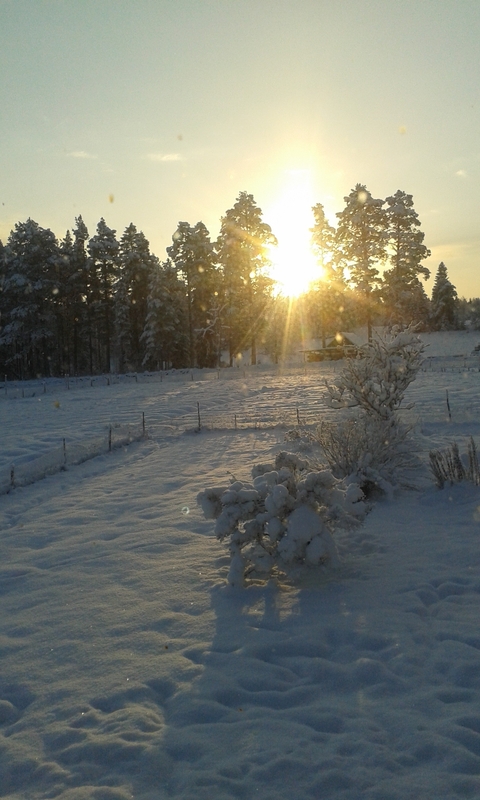 It is perfectly beautiful, but unnaturally warm for Sweden at this time of year. Tellus Think Tank is bustling with questions. I learn that CEMUS stands for “Centre for Environmental- and Development Studies” and that Sachiko Ishihara grew up in Tokyo, Japan. She is one of four siblings, has lived in Sweden for two years and is currently employed by CEMUS to coordinate the course “Global Challenges and Sustainable Futures”. What is CEMUS and what is its educational scope? Sachiko Ishihara describes the educational scope of CEMUS to cover almost anything that has to do with sustainability. 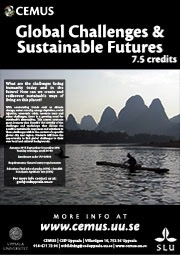 The center interdisciplinary courses in the sustainability area, broadly covering development in society with courses like the more theoretical “The Global Economy” and like the more hands on “Urban Agriculture”. Race for the Planet Board game – the project is creating a board game where the players need to collaborate, instead of compete, in order to increase sustainability. The Latvia and Sweden re-use project. The Culture Carnival – now an annual May happening in Uppsala and open to the public. At this point the acting Program Director of CEMUS, Daniel Mossberg, enters the room to say hello! He adds another inspiring student project to the list and tells us that one student project rebuilt an old Volvo car to run on gas instead of petrol! Sachiko Ishihara didn’t take the specific Project Management course, however she did start her own world improvement project with two fellow students. Ekolibria – a world improvement project. ‘Ekolibria’ and they organise visits to schools to educate children of all ages about sustainability. Talk about walking the talk! The center of CEMUS was founded in a special way? –Yes it was! 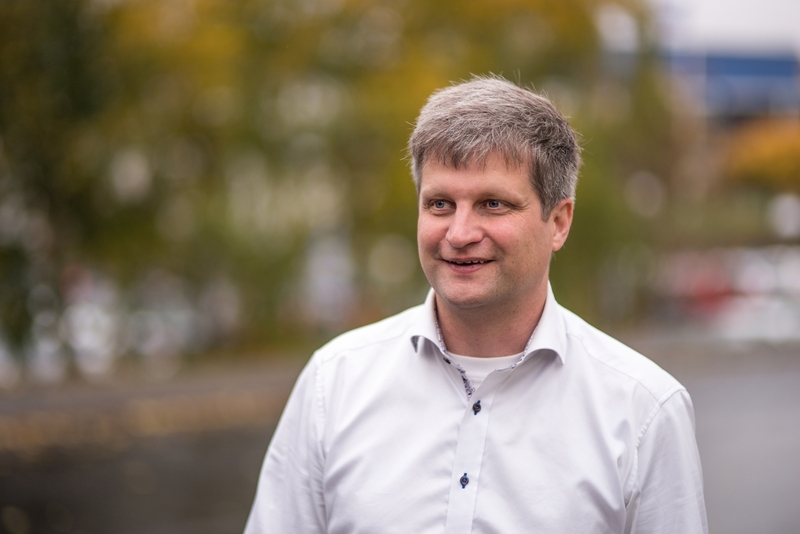 Two students, Niclas Hällström and Magnus Tuvendal, founded CEMUS over 20 years ago! The two students were given the opportunity to discuss the lack of interdisciplinary educational possibilities with the president of Uppsala University with the result that the University asked them to organise an interdisciplinary course on the subject “Humanity and Nature”. The fellow student interest was so large that 400 students signed up for the course. Since then CEMUS has developed into a university center at the University of Uppsala, annually offering 20 interdisciplinary sustainability courses. Sachiko Ishihara tells me that 50 % of these are held in English and that CEMUS attracts about 50% of its students from countries other than Sweden. 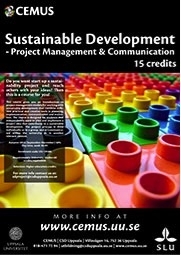 Project Management and Sustainability course at CEMUS. What makes CEMUS unique as a pedagogical institute of Sustainability? Sachiko Ishihara proudly tells me that CEMUS-courses are not coordinated and put together by professors, but by students or recent graduates that are employed in the role as Course coordinators. The Course Coordinators have the official university title “Amanuensis” which normally is a student that is also employed to do administrative work for the university. However, at CEMUS, employed students are given far more responsibility. What are the Course Coordinators responsible for? Make sure that the red thread of the subjects and contents are held. The course coordinator gathers a knowledgable work group of specialists, such as professors and research students, for feedback on the content of their course. When the course content is ready the course coordinators organise the course by inviting speakers, facilitating student discussions, projects and assignments. Depending on the individual, some even hold educational sessions for fellow students. What does CEMUS mean by interdisciplinary? 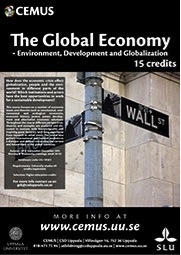 The Global Economy an interdisciplinary CEMUS course. A discipline is another word for subject, according to Wikipedia (2015-10-02). An interdisciplinary course at CEMUS means creating an insight, by crossing subject boundaries. Sachiko Ishihara says that the CEMUS interdisciplinary courses help students to understand the dynamics and processes of the world, how they are created and have influenced present settings. Subjects that might be combined in their inter-disciplinary courses span widely from for instance Environmental Science, Democracy, Ethics, Business, Biology. The CEMUS course coordinators invite speakers from many different areas, not just professors but also non-academics, business people, entrepreneurs, engineers, activists and representatives from non-profit organisations, to mention a few. All with the purpose of helping their students understand how the development of our world works. Sachiko Ishihara mentions speakers like the writer and singer Alan AtKisson and the Swedish politician, Gudrun Schyman. I also read on CEMUS homepage about open lectures with activist Polly Higgins and US Professor in Systems Management, Dennis Meadows. What kind of people seek educational possibilities at CEMUS? We take a walk through the building and find an early assignment on sustainability issues where students identify problems in their hometown. I can see Colombia, The US, North Korea, Japan, Australia and Sweden on the board, to mention some. Students come from different majors and academic disciplines, for instance, Engineering, Art, History or Business and have a strong interest in improving the world and learning more about sustainability. Sachiko Ishihara, also concludes, that some students are totally new to sustainability and are curious to learn more! What does sustainability mean for the people at CEMUS? -The people that meet at CEMUS have a diversity of views, she says. Rather than one common approach the people of CEMUS range on a wide spectra from radical- to mainstream thoughts, just like the general public. Sachiko Ishihara concludes that there is a common basic understanding among all students and staff of CEMUS and that is: Life on earth needs to change to be more sustainable. What is the overall message that CEMUS is sending to students and society? -Society needs to change and CEMUS holds criticism towards inequality, waste, non-sustainable use of the resources of earth. There is also a unique belief in young people and the questioning of normative values and traditional experts. How can students and society notice the core beliefs of CEMUS? According to Sachiko Ishihara, the first thing you would notice is that CEMUS, by putting students in course coordinator roles and other responsible positions, breaks the norm of the academic hierarchy. 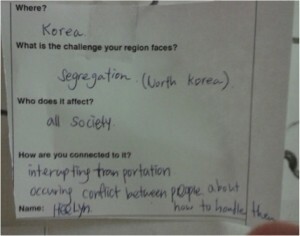 -Secondly, you would see the active and structured encouragement of students to discuss and question normative beliefs. -Thirdly, CEMUS is all about activating people and doing things differently to improve results, Sachiko Ishihara continues. students to work in diverse and internationally mixed groups. 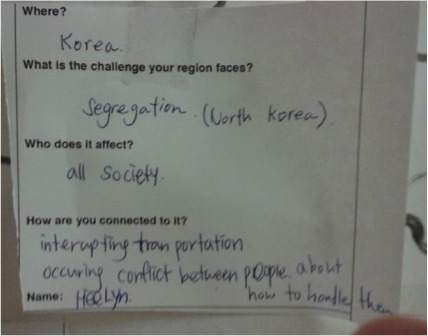 The mixed groups give different perspectives on issues and enhance student motivation and understanding. When debating and exploring contradictions in the needs of the world, students easier understand why trade-offs are made. For example, students from the so-called “developed” countries may argue that Earth doesn’t need any more growth, and call for “de-growth”. Students from the so-called “less-developed” countries might, in their turn, question this statement. -CEMUS does not run a one-way education, Sachiko Ishihara concludes. How is CEMUS helping to save the world? -CEMUS education will make a difference, by activating individuals with an educational process that plants seeds by education, training of critical thinking, diversity and training in proposing solutions. Sachiko Ishihara and I are back in the CEMUS-library and thank each other for an interesting meeting. I can conclude that her creativity, courtesy and knowledge have been really inspiring! 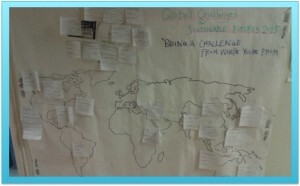 NEXT: Tellus Think Tank find is it good to see that at least Swedish Universities are taking Sustainability seriously. We are curious as to what other countries are doing so we book a meeting with the University of Newcastle. However, next week we will be visiting the first Eco Village of Sweden to learn from their learning! NEWSLETTER: If you have signed up for our weekly newsletter we will send you a note when the article is available! 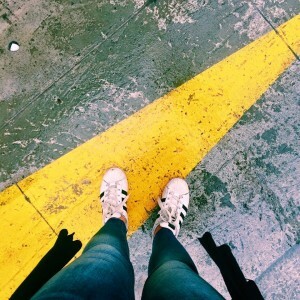 IDEAS: Do you feel inspired, or curious? Is there anything you would like the Tellus Think Tank team to cover or investigate? Let us know!